Well it seems that Spring has finally arrived, after a seemingly endless bitter cold spell from late January through the first of March. But now we are predicted to be in the 50’s and 60’s every day through the end of the month, so I don’t see much chance of Winter returning until much later this year. 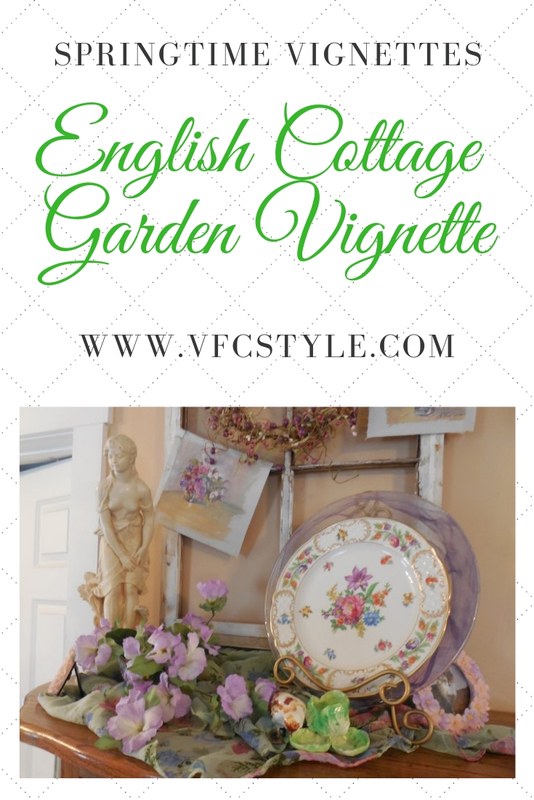 I love this arrangement because it has sort of an “English cottage garden” vibe to it with the statuary, rambling flowers, and small still-life paintings. 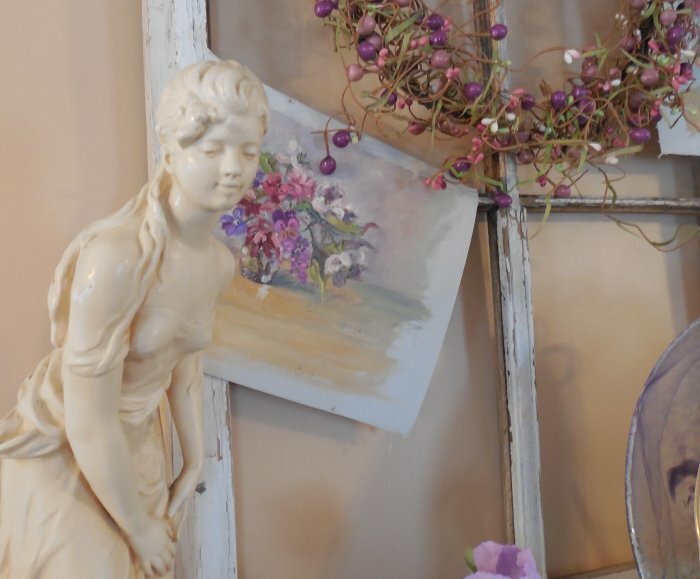 It makes me think of the book Sense and Sensibility by Jane Austen – set during a time when noble-born English girls were taught to sketch and paint, and to speak French, and to flirt just enough to catch a noble husband. 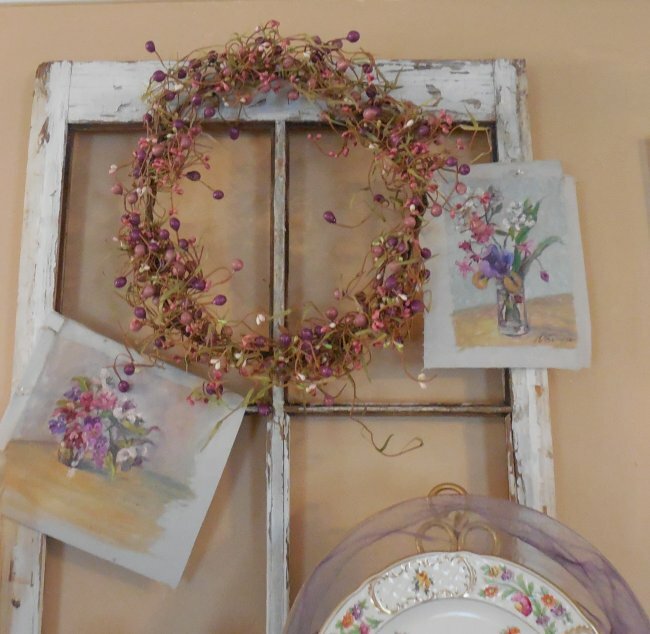 I have several old chippy windows used as decor around the house; this one was a bargain for $2.50 at an area barn sale. 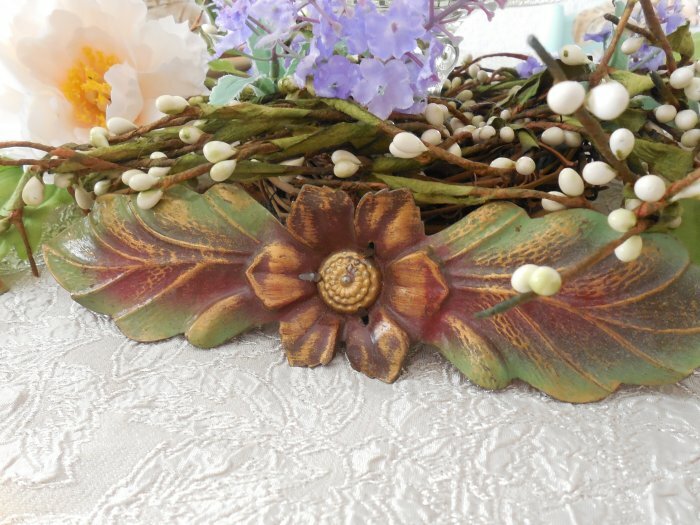 The pip-berry wreath was a thrift store find. The little paintings were a recent auction win. They are by a local artist named Nancy Semcoe Link, and I acquired about five of her pictures in the same lot. These two were both painted on the same canvas, and I separated them to give them the appearance of having been torn from a sketchbook. 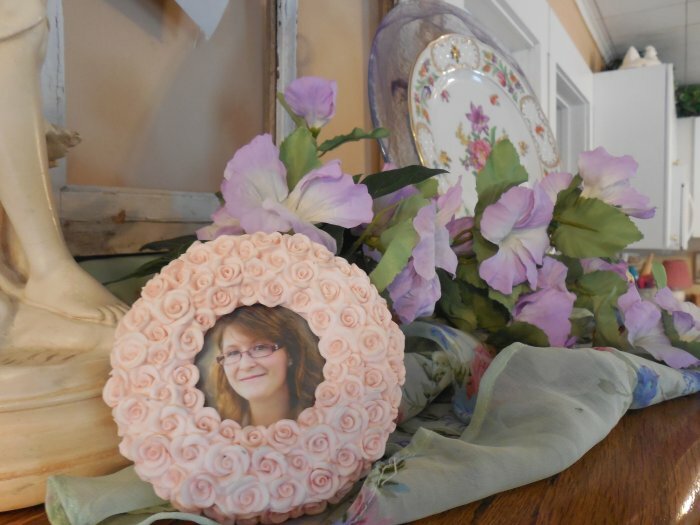 The small photo is of my daughter, tucked into a resin frame of soft pink roses. 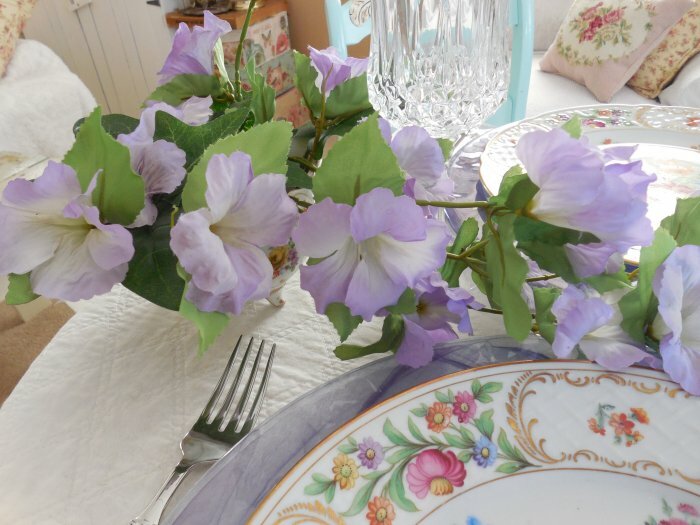 The silk flowers, purple charger, and Dresden dinner plate are thrift store and Ebay finds, featured in a recent Springtime tablescape. 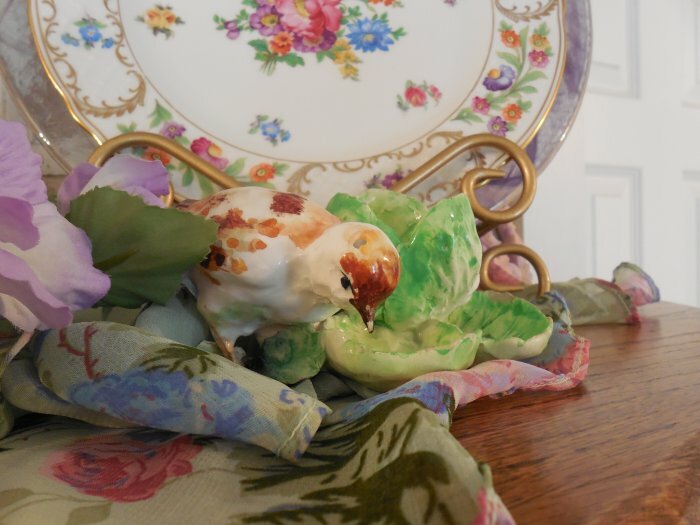 The little clay bird figure came in a box lot at the afore-mentioned auction – I can’t believe he didn’t get broken. 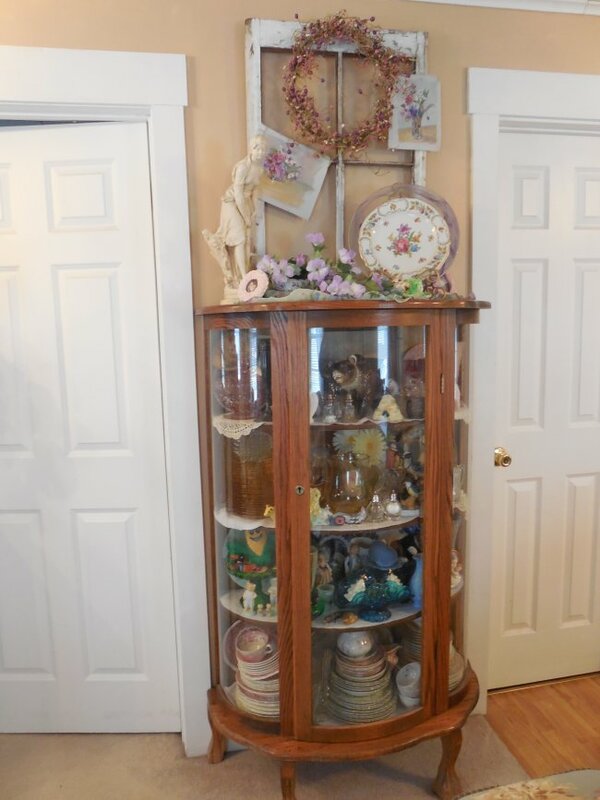 Here’s a picture showing how this cabinet is situated in the room, set along the wall between a bedroom and bathroom. I’m thinking about painting this cabinet a very light aqua. It is solid oak, but I don’t think it’s terribly old. 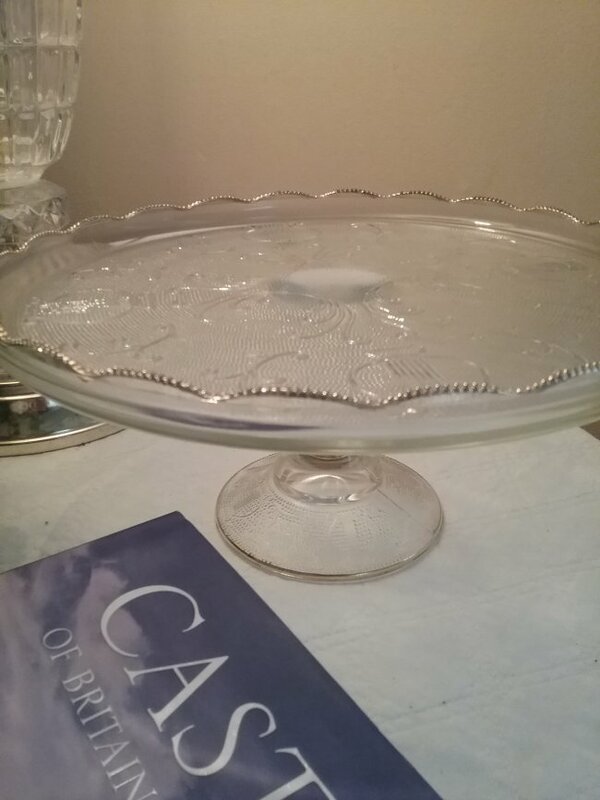 The glass is curved but not wavy like very old glass. 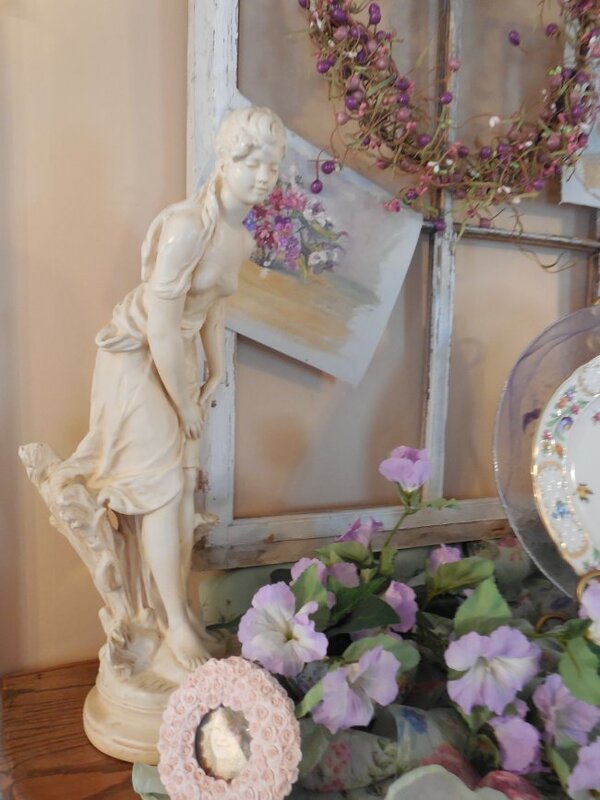 My friend Traci (who does beautiful painted furniture pieces) has painted a similar cabinet white, and there’s one painted white at the antique shop where I work that is used as a display piece – I think they both look wonderfully “shabby chic,” but Greg worries that it’s an antique and shouldn’t be painted. I just am not sure about its age. 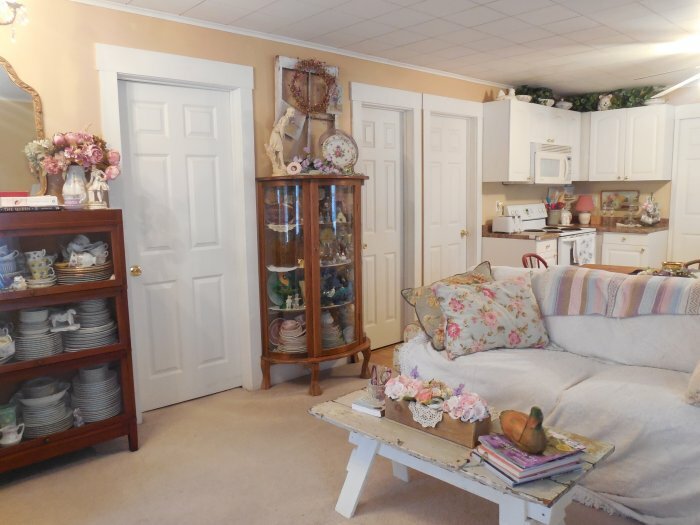 What do you think – to paint or not to paint? 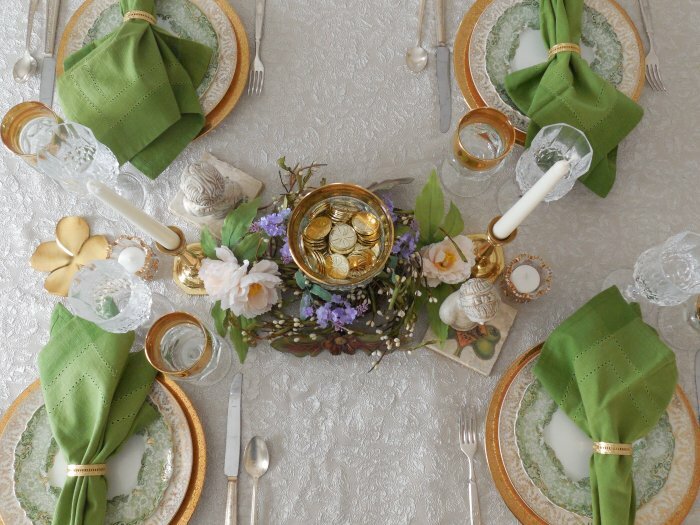 My color scheme was green, gold, and ivory, and I knew I wanted to incorporate those coins. 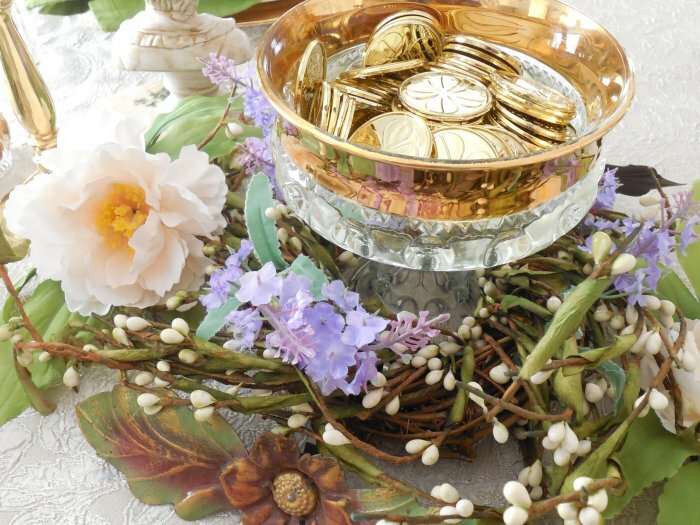 I decided that the “pot of gold” would be part of the centerpiece, and I used a gold-embellished crystal compote in an Early American Pattern Glass (EAPG) pattern called King’s Crown Coin Dot. 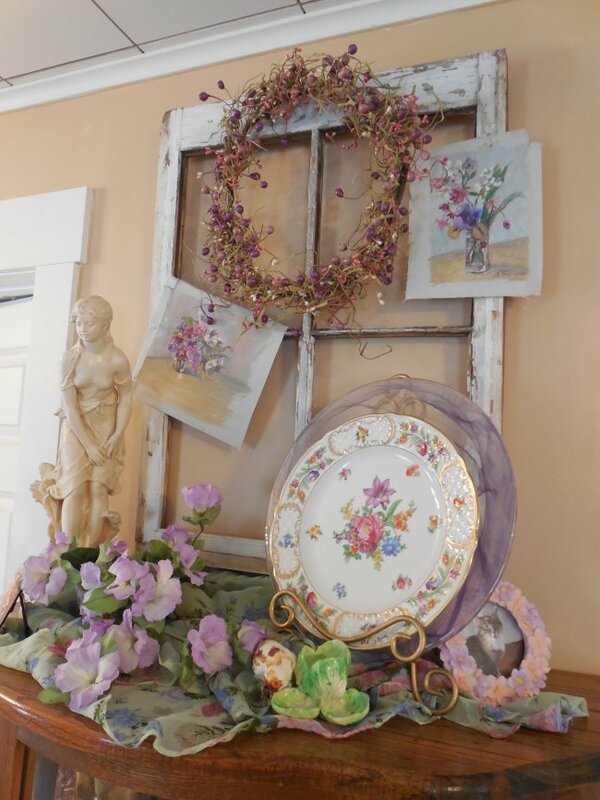 I used a small silk floral-and-pip-berry wreath to surround the compote, with a few additional silk blooms poked in and around. 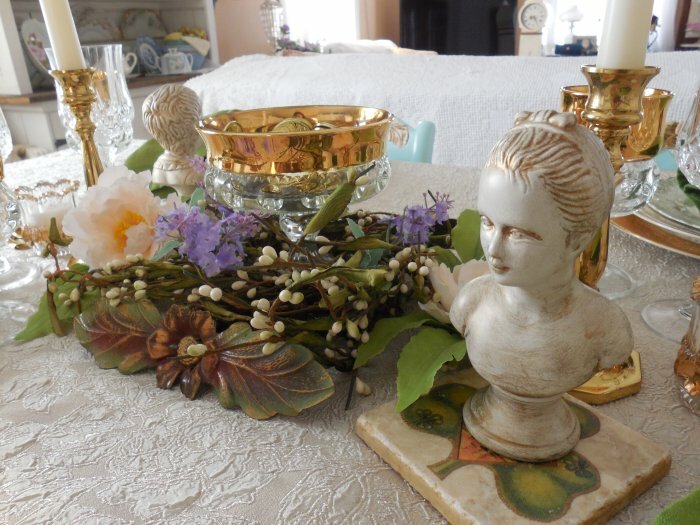 I also had these really interesting metal bits (embellishments off a piece of furniture I think) that I felt had almost a Celtic vibe to them, so I included those as part of the centerpiece too. 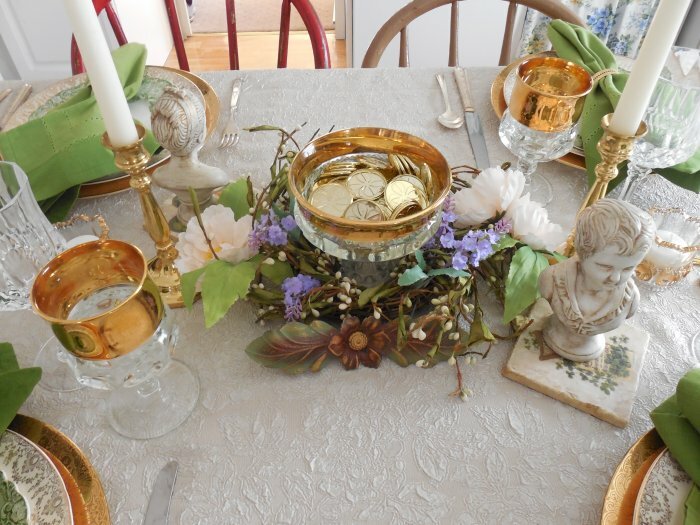 I added a few other elements to extend the centerpiece out to the left and right: a pair of boy and girl busts sitting on top of Irish-themed stone coasters, gold candlesticks, and a pair of votives in matching crystal-and-gold EAPG toothpick holders. 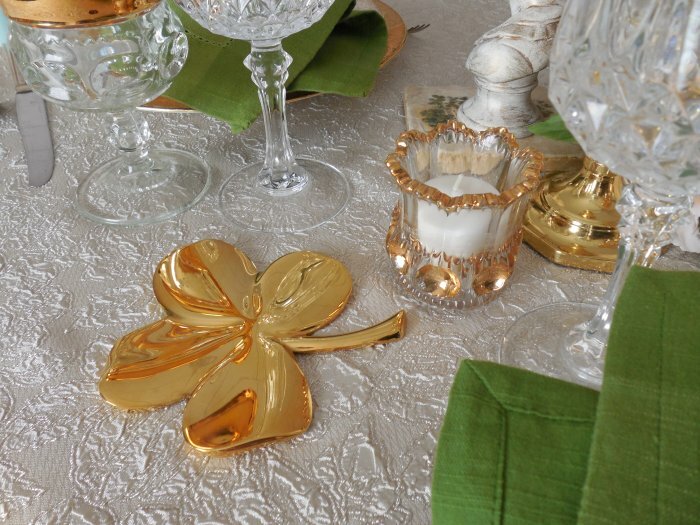 The gold shamrock paperweight adds some sparkle as well. 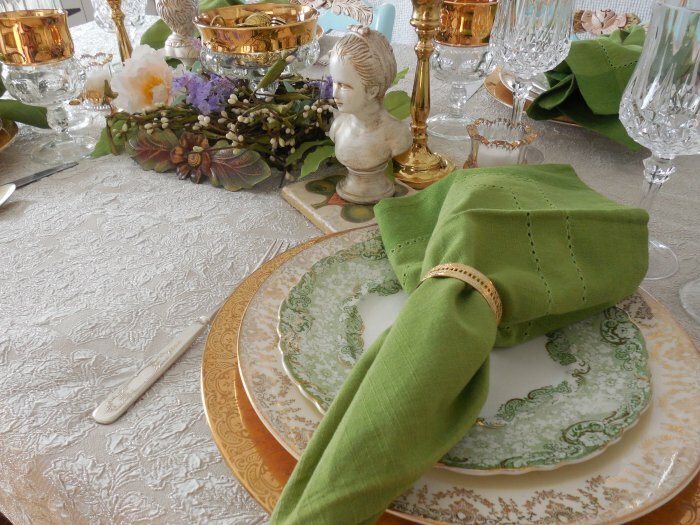 The tablecloth is a drapery panel in a lovely champagne color. It adds a great deal of texture, too. 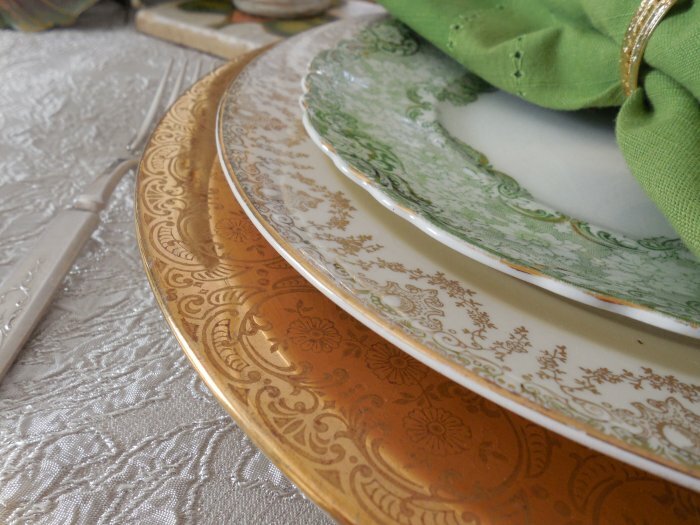 My plate stack includes three pieces: the top plate is green and gold transferware by Alfred Meakin of England called Roxbury and was also used in my red and green Christmas luncheon table last year. 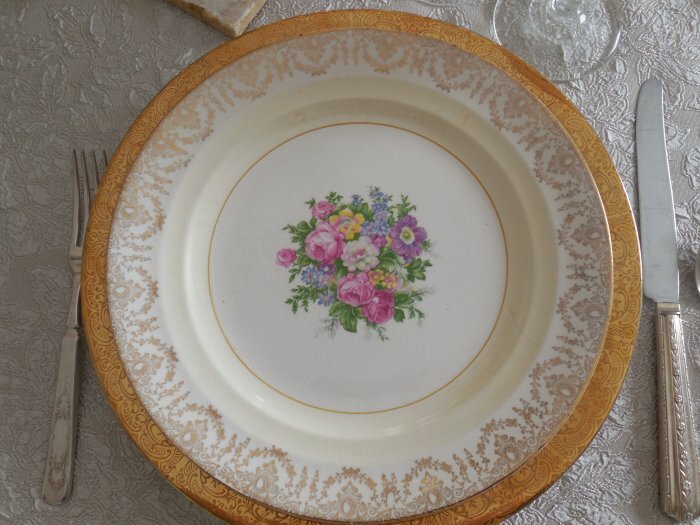 The center plate is marked Crown Potteries USA and has a pretty floral spray in the center as well as gold embellishments around the shoulder. 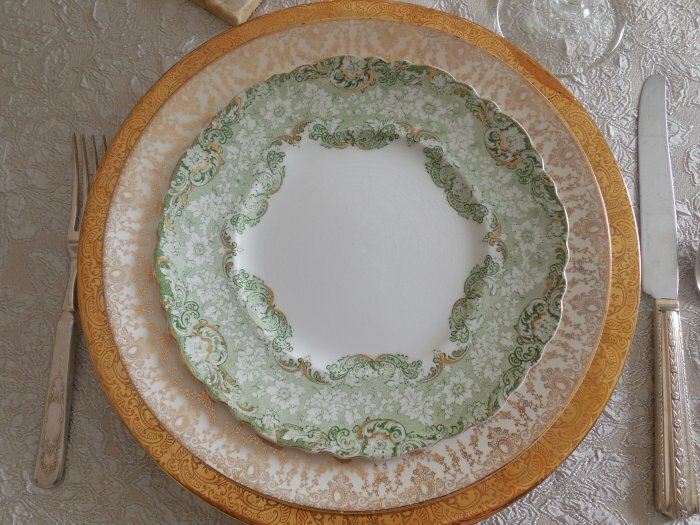 The bottom plate has a beautiful wide gold shoulder and was used in a Christmas tablescape in 2017. 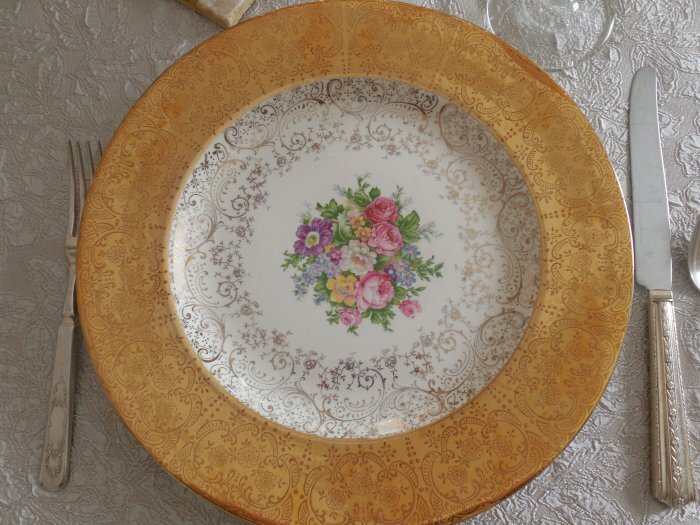 It isn’t marked but the center floral design is identical to the one in the other plate so I’m surmising these are also by Crown. 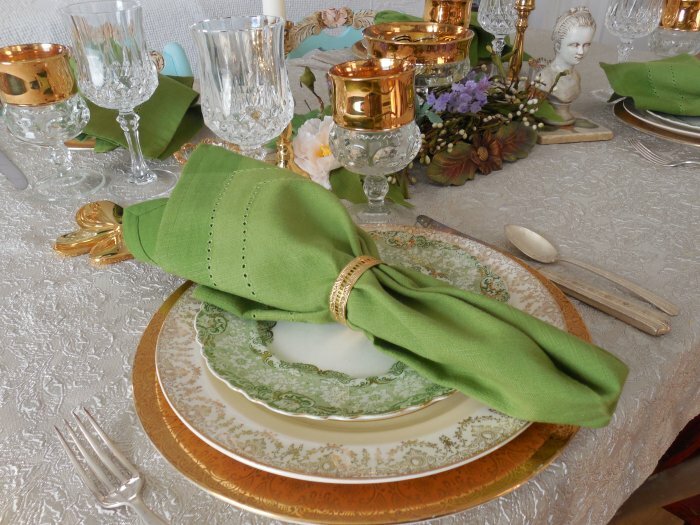 Hem-stitched napkins are by Pier 1. 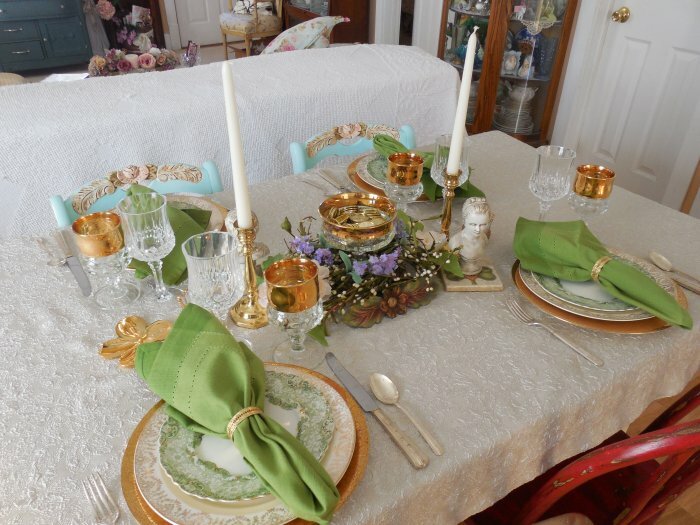 The green hue is very similar to that of the wreath used in the centerpiece. 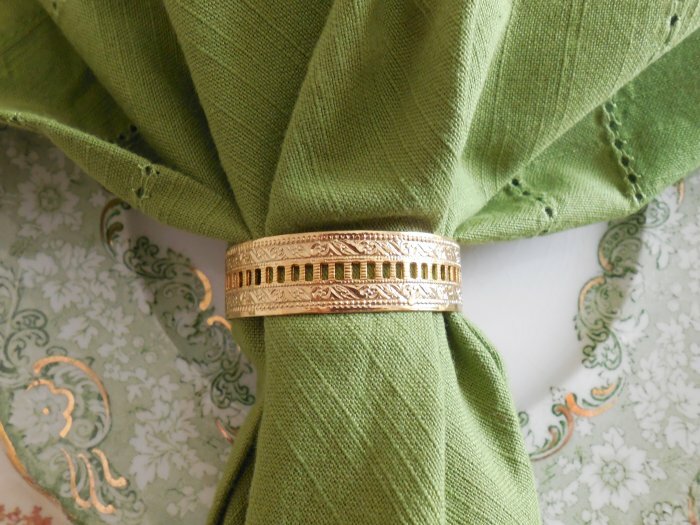 The thin gold band napkin rings remind me of wedding rings. 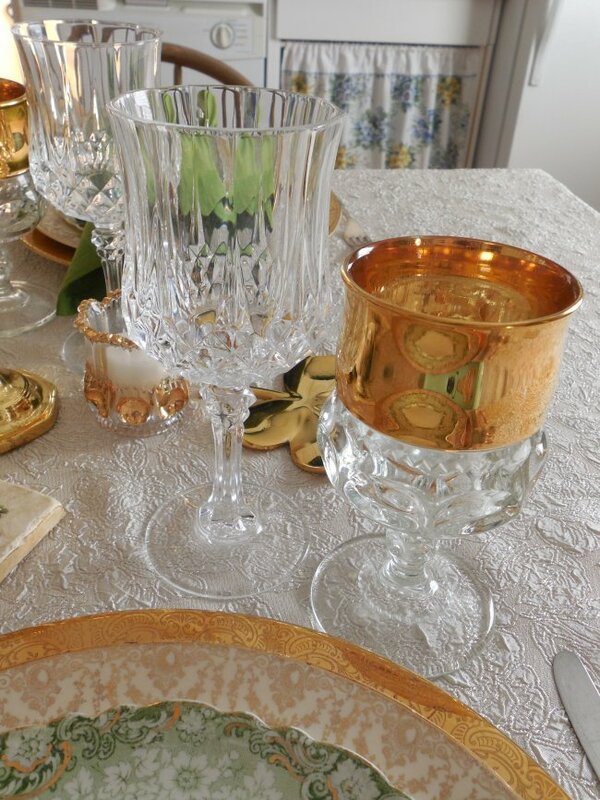 Glassware is Cristal D’Arques “Longchamps” on the left, and EAPG King’s Crown Coin Dot on the right. 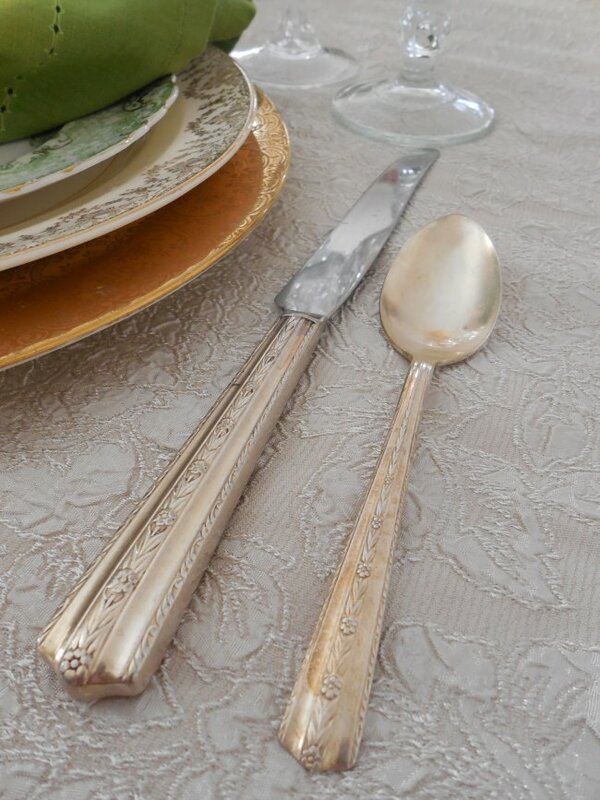 Flatware is mismatched silver purchased at an antique fair last summer. 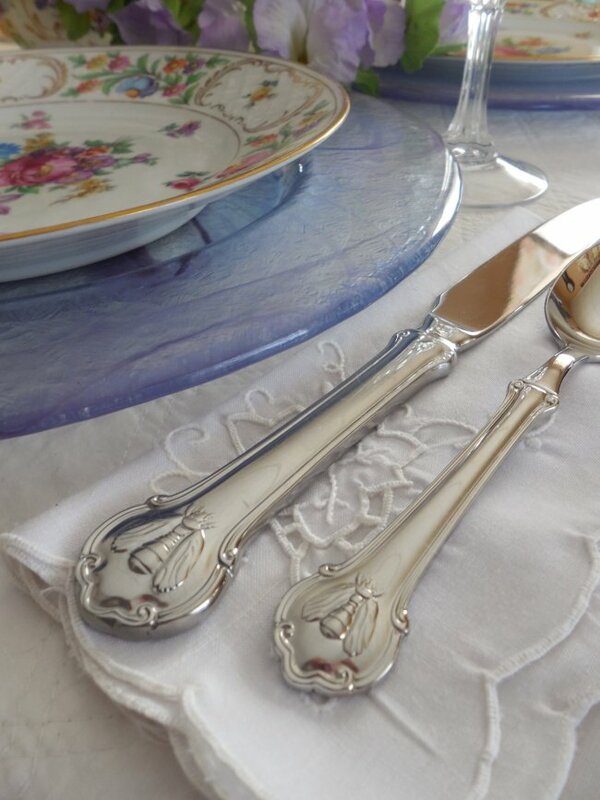 I realized when photographing this table that the forks have a tiny letter “P” on the handles – I never noticed that they were monogrammed until now! 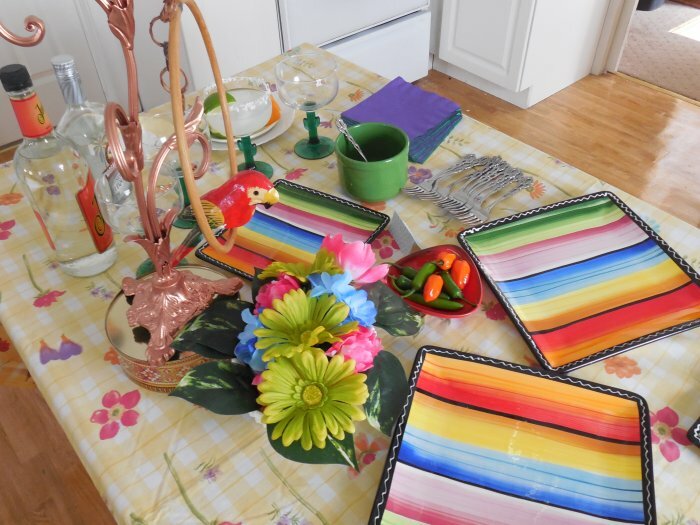 Here’s the put-away shot, with everything gathered up and ready to go back into the cupboards. 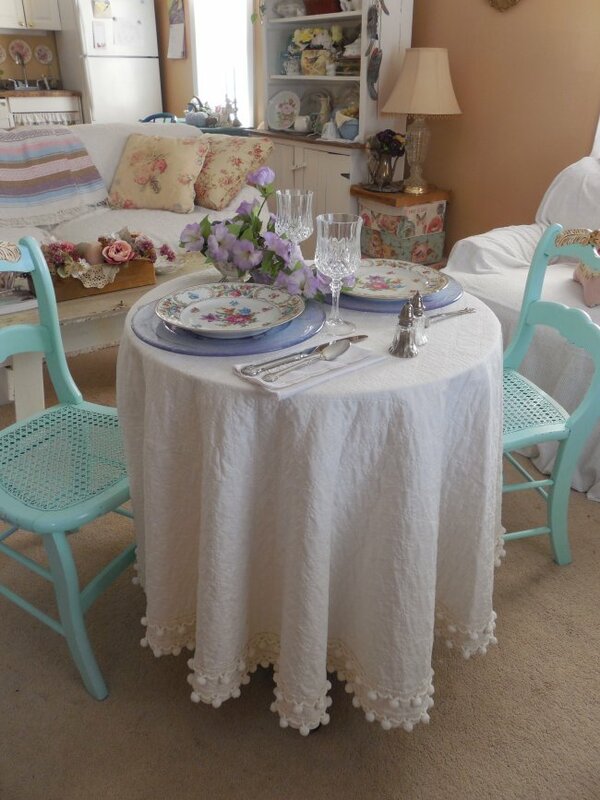 And here is an image suitable for Pinterest if you would like to pin this table for future ideas! 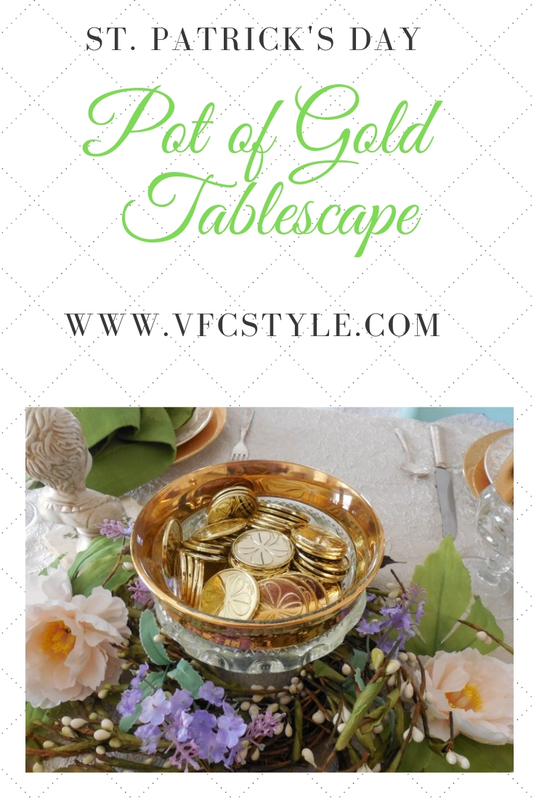 I’ll be sharing my “Pot of Gold” St. Patrick’s Day table over at Susan’s lovely blog, Between Naps on the Porch, for Tablescape Thursday! 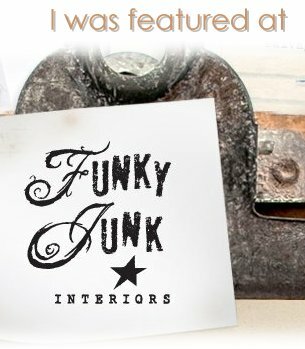 Hope you will click through for lots more inspiration! 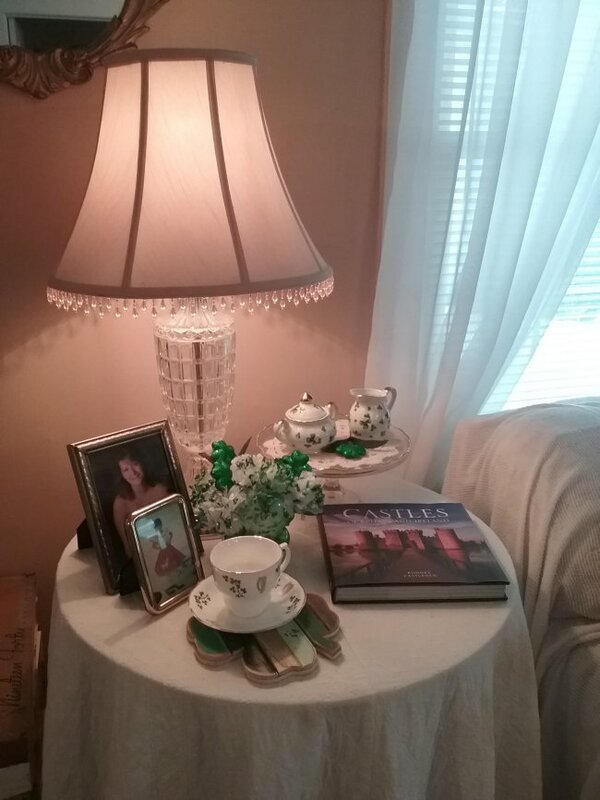 I enjoy changing up the vignette on this table in my living room frequently. 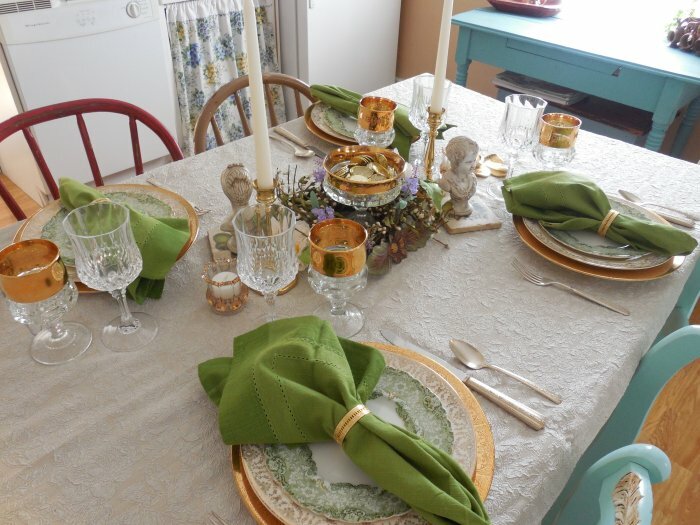 I used it just recently for a tablescape for two, but the fact is it’s not a very good table for eating because you can’t scoot the chairs up to it since the base prevents you from getting your knees and feet tucked in underneath. 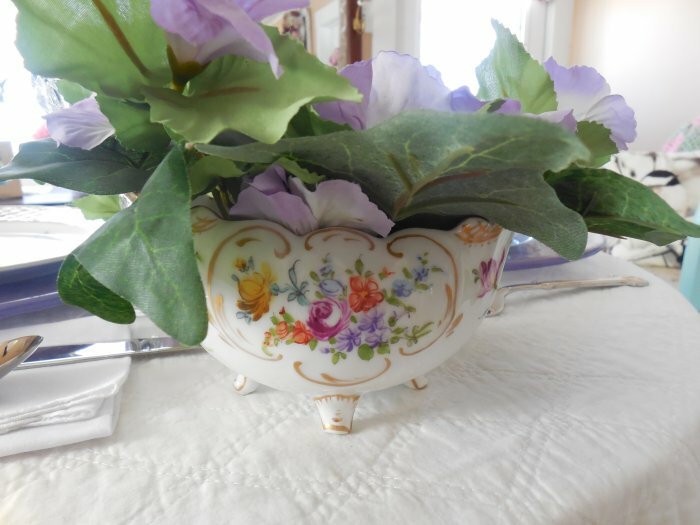 Still, it is a favorite piece – my grandparents restored it decades ago and it remained in their home throughout my childhood. 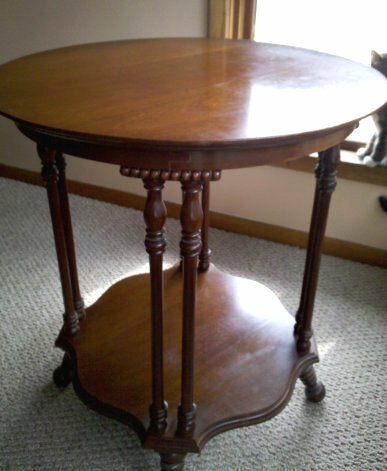 I don’t know its true age but I have known it for my entire life as “Grandma’s table.” Here’s a photo of it I have shared before from my previous home, which shows its pretty details. 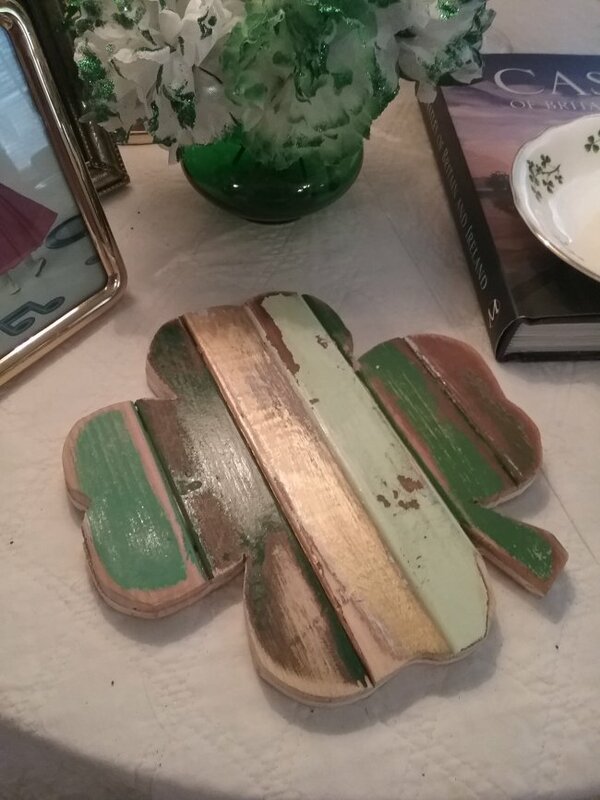 I decided to set out the few pieces of Irish-themed decor that I own… it’s not a big holiday for me but I do have a bit of Irish blood (actually Scots-Irish, according to my mother). I also confess I have been binge-watching Downton Abbey again and paying a bit more attention to the world history that gets shared in this program through the dialog and storylines. There are many layers to this show, and how actual historical events impact and motivate the characters – including Irish Socialist Tom Branson and his beloved Lady Sybil Crawley – is one of the reasons I find it so re-watchable. But – surprise! – I digress. 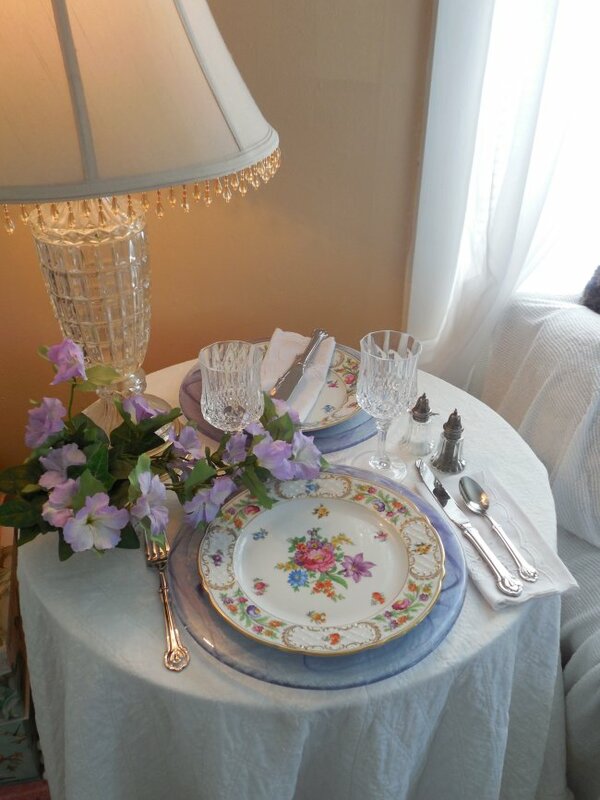 My pretty “Grandma’s table” is still wearing its winter white tablecloth with the ball fringe, but that will be coming off soon in time for the arrival of Spring. 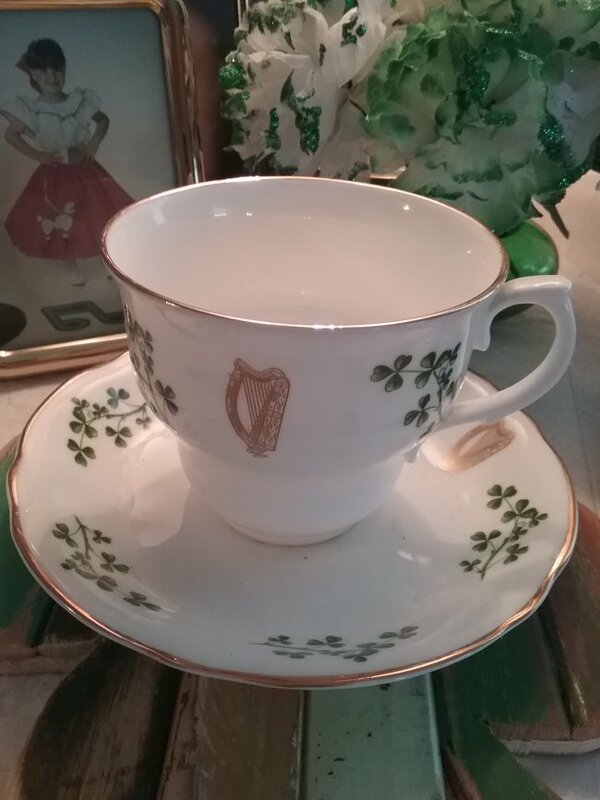 I have set out a few lovely Irish-themed bone china pieces, including my Lefton creamer & sugar bowl and a pretty cup and saucer by the Irish pottery Arklow, all adorned with emerald green shamrocks. 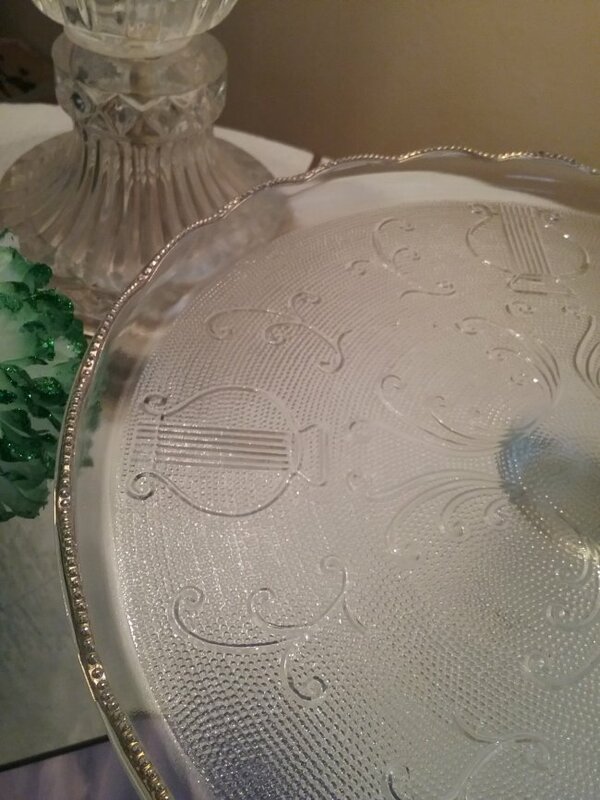 Another traditionally Irish motif is the lyre, and the cake stand which holds the sugar & creamer features this pretty raised pattern. 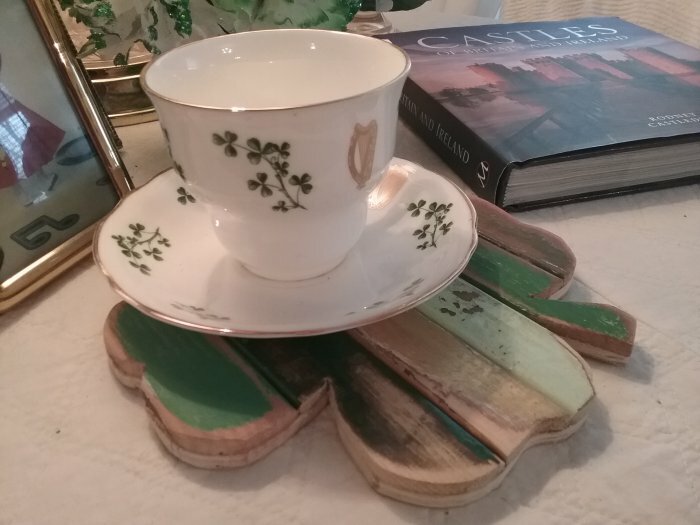 The cup and saucer are perched on a handmade wooden shamrock trivet. 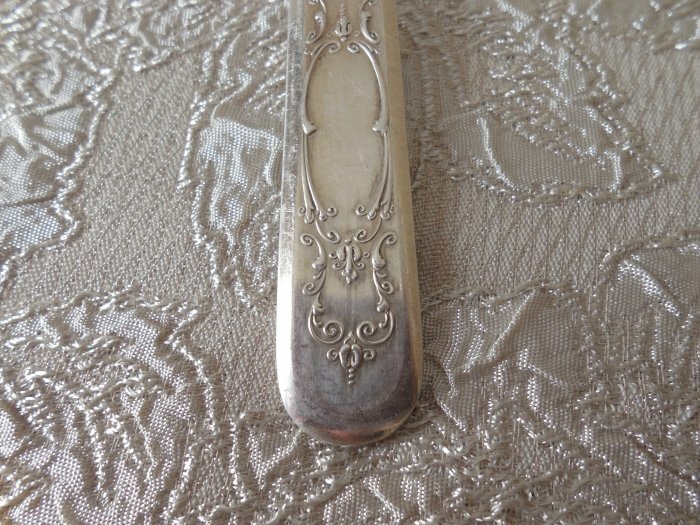 This piece was made by a young man who has a booth in the antique mall where I work (and also have a booth). 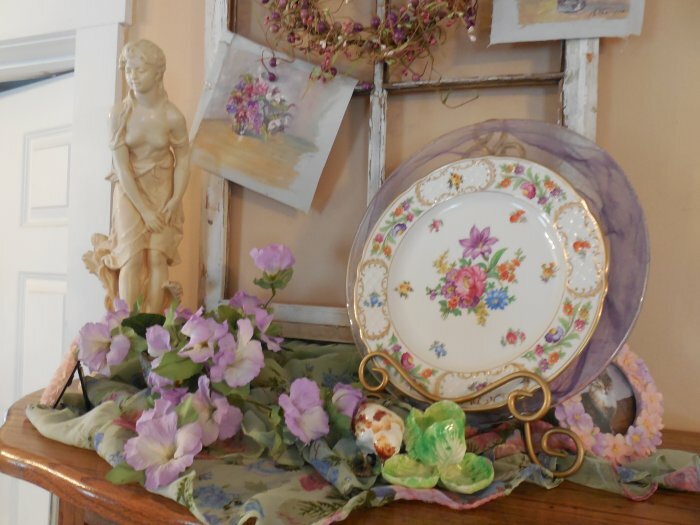 I love the various distressed paint colors including the shimmery gold. 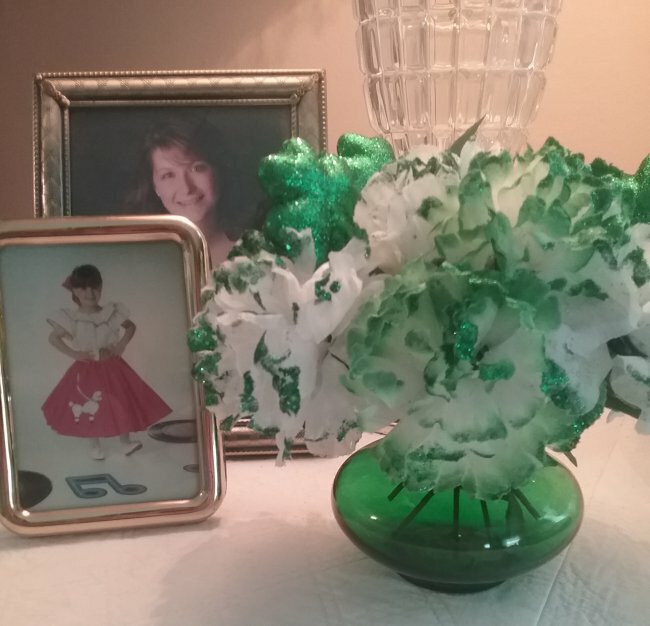 I popped a few fanciful Dollar Tree silk carnations into a deep green ruffled vase, displayed here with photos of my own sweet lass. 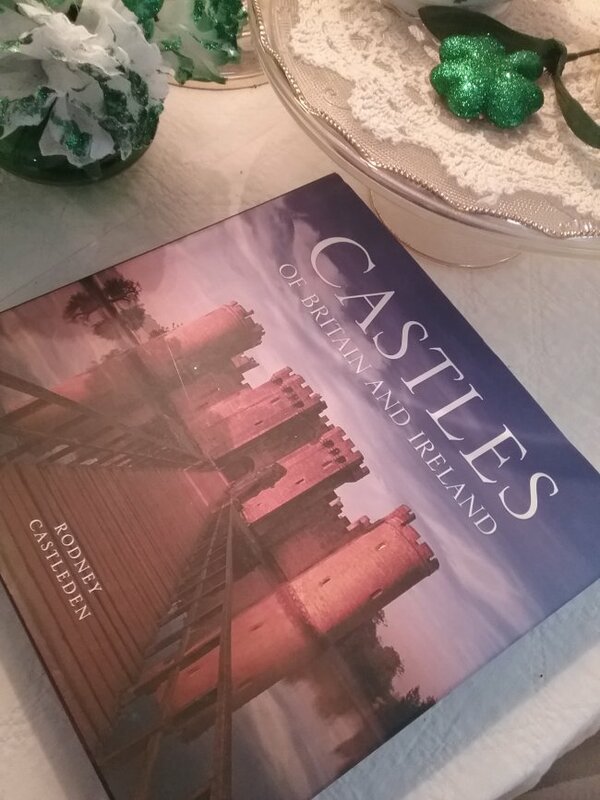 I’ve also set out my book of British and Irish castles. 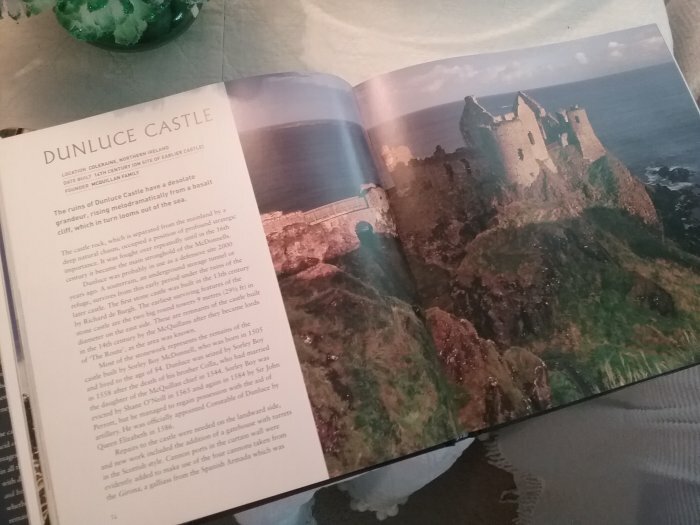 This book is absolutely gorgeous to browse through, and features stunning landscape photography from England, Ireland, Scotland, and Wales. 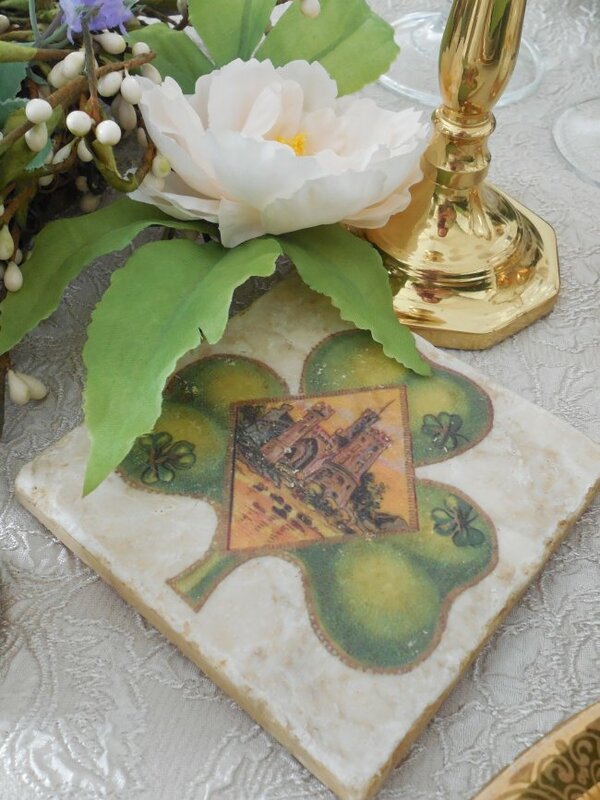 Do you celebrate St. Patrick’s Day? 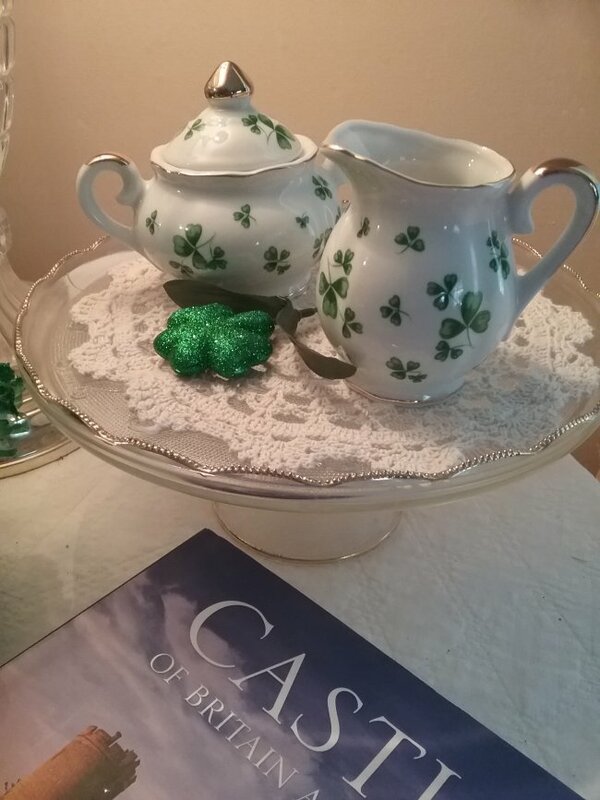 Enjoy corned beef and cabbage? Have Irish heritage or perhaps a revolutionary chauffer in your family tree like the handsome Branson? Do tell! 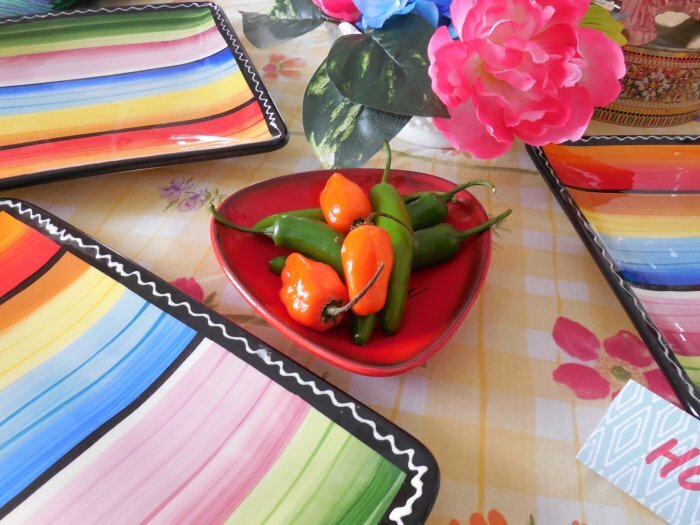 What is your favorite source for discovering new dinnerware patterns? 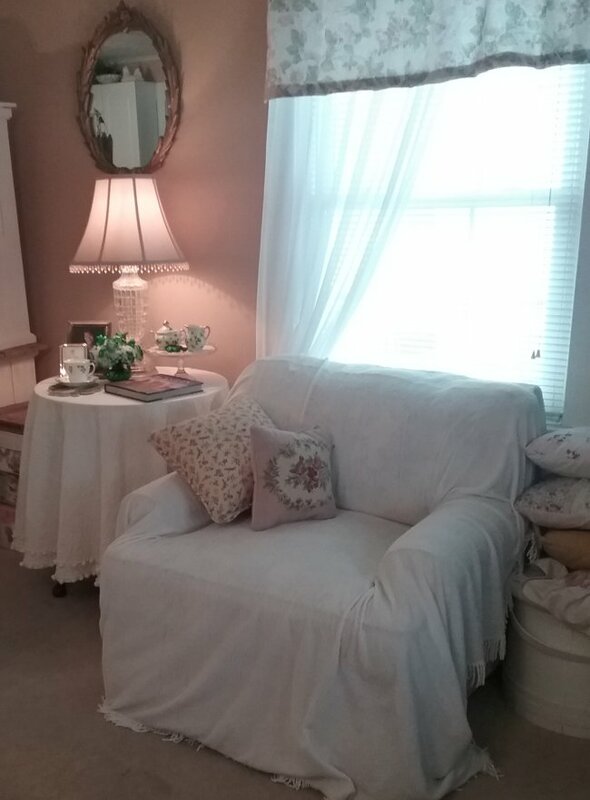 Two of mine over the years have been thrift stores and Tea Time Magazine. 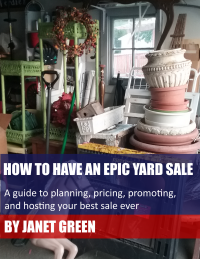 Thrift stores, of course, offer the thrill of the hunt and instant gratification when you find something you like. 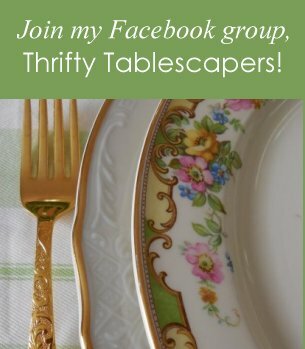 Tea Time offers beautifully photographed tablescapes, and there is always at least one pattern in every issue that I immediately add to my “saved searches” on Ebay so I can begin the hunt for bargains. 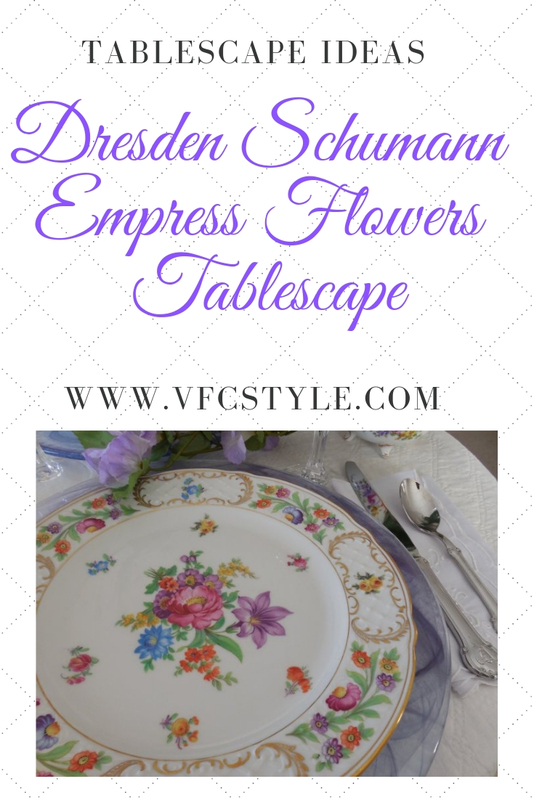 The dinner plates in my Springtime table for two are Dresden Schumann Empress “Flowers,” which I originally spotted some years ago in Tea Time. 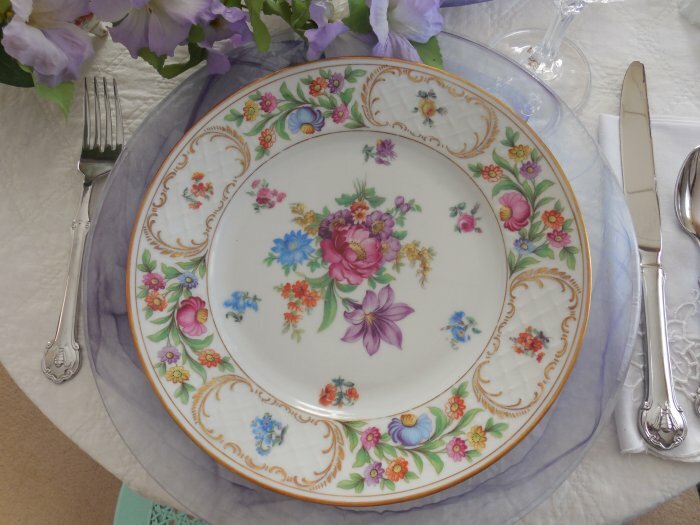 These were a rare splurge for me – in the double-digits per plate – so I only own two of them. 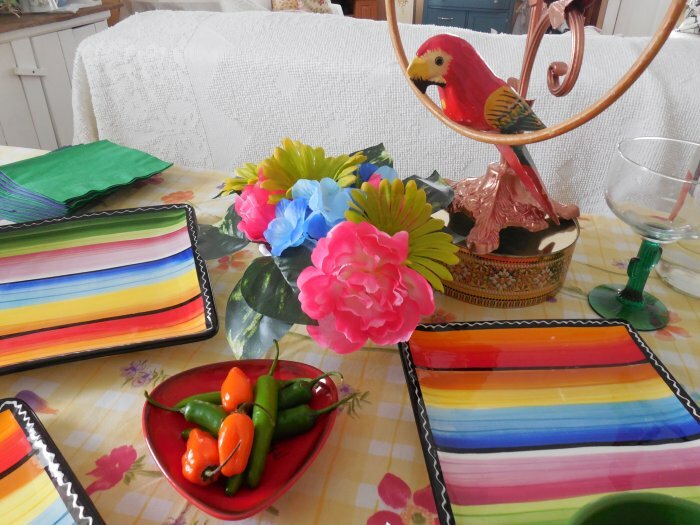 They have only always been displayed on a shelf – never used for an actual meal, because I’m kind of afraid of breaking them. 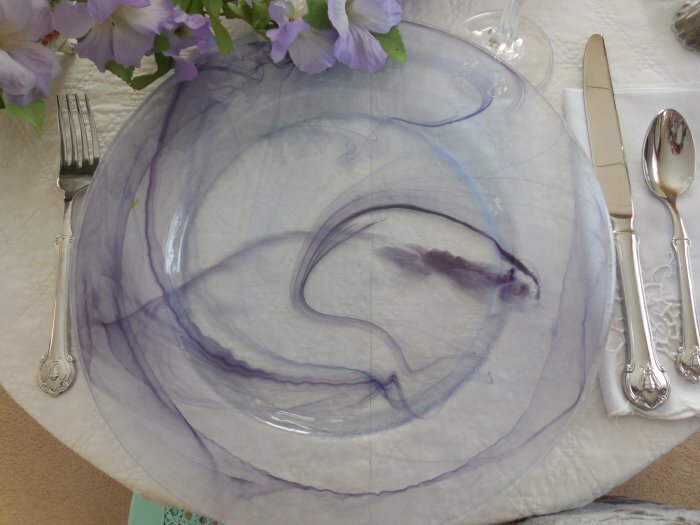 But recently, knowing that Spring must literally be “just around the corner,” I decided to try to find something that would coordinate with a pair of amazing purple glass chargers that I found at Goodwill about a year ago. I also only have two of these – there were four on the shelf, but two were damaged so I did not buy those. 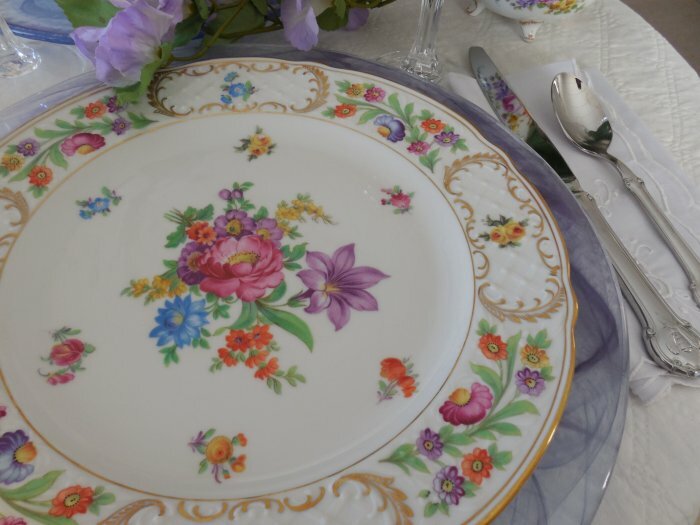 In trying various combinations, I found that the Dresden looked fabulous with them, and I loved the contrast of the contemporary chargers with the classic floral plates – so that was that! 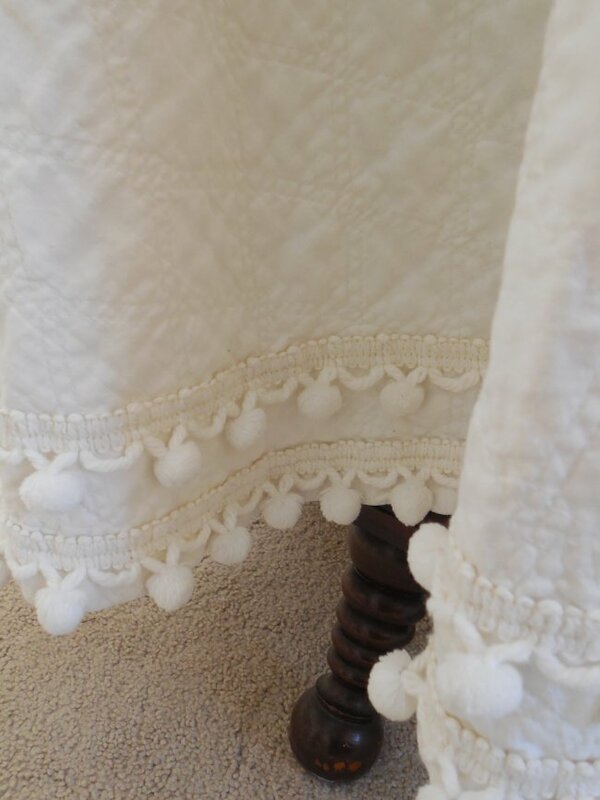 This quilted white tablecloth – also a thrift store find – looks so pretty with its rows of ball fringe! Stopping just above the “ankle” – how risqué! 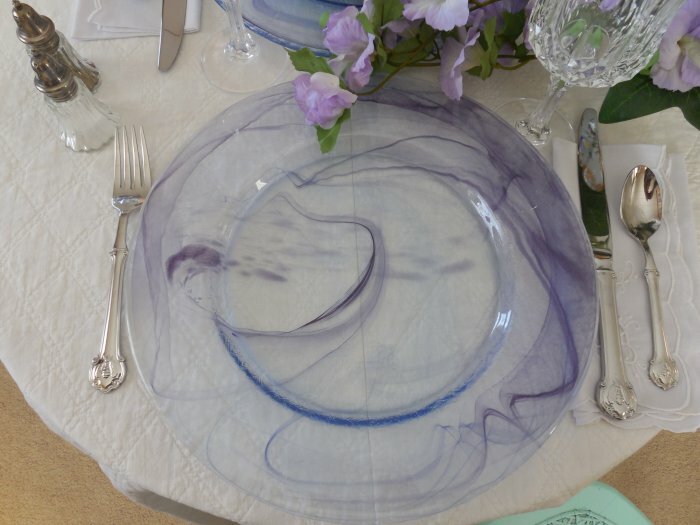 The place settings are simple and consist of the Dresden dinner plate on top of the purple glass chargers. 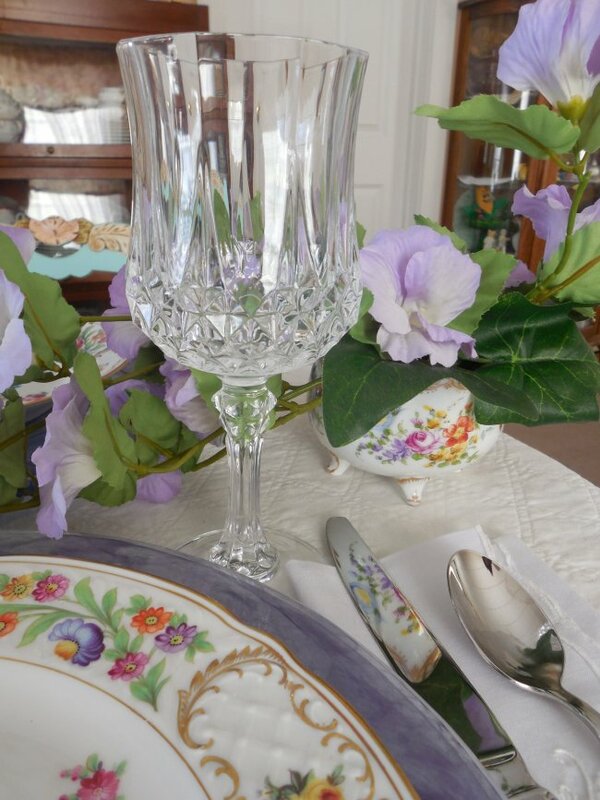 Glassware is a beautiful pair of lead crystal Longchamps goblets, made by Cristal D’Arques and, for me, a thrift store find. 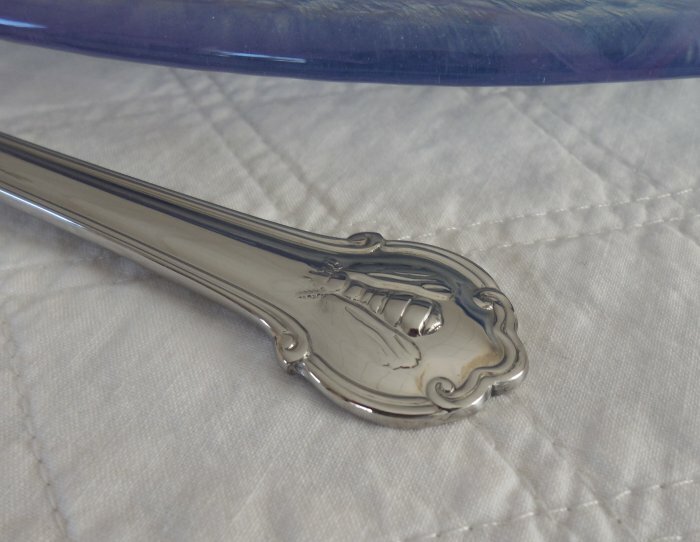 And, something new in the flatware collection! This is “Napoleon Bee” by Wallace – perfect for Springtime and the welcome return of our honeybee friends. Right now I only have two sets because I have been collecting them brand new at full price. I just love the sweet little bees! 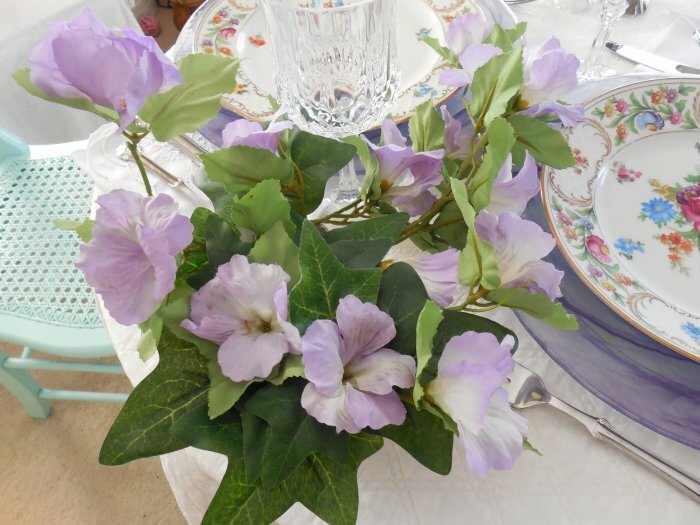 The centerpiece is very simple – some thrifted silk lavender-hued flowers and English ivy in a small footed bowl that echoes the design of the Dresden dinner plates. 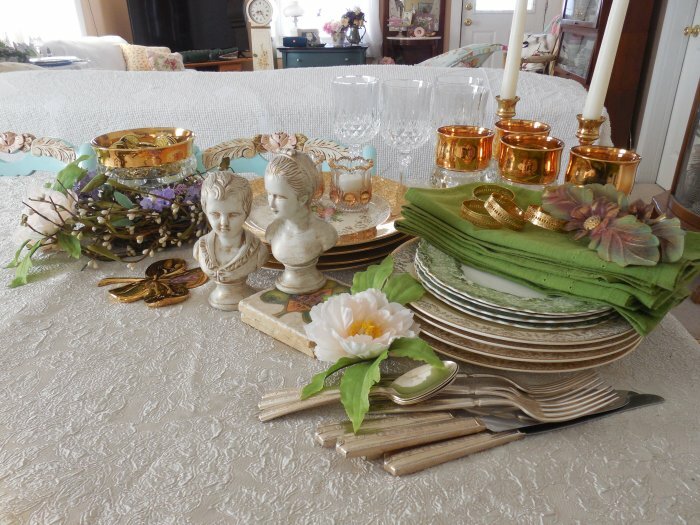 But guess what – no put-away shot this time, as I decided to leave this little tablescape set up even after putting the table back in its spot beside the comfy chair. 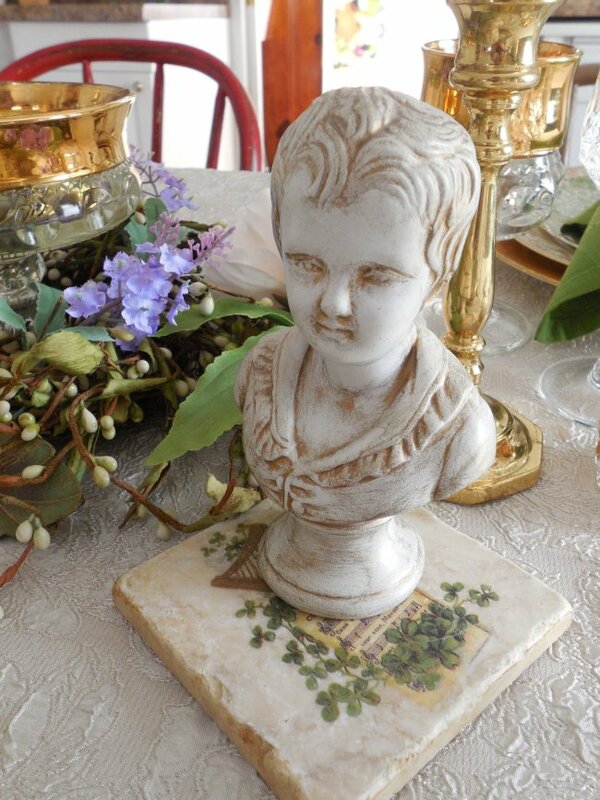 It has become part of my Spring décor! 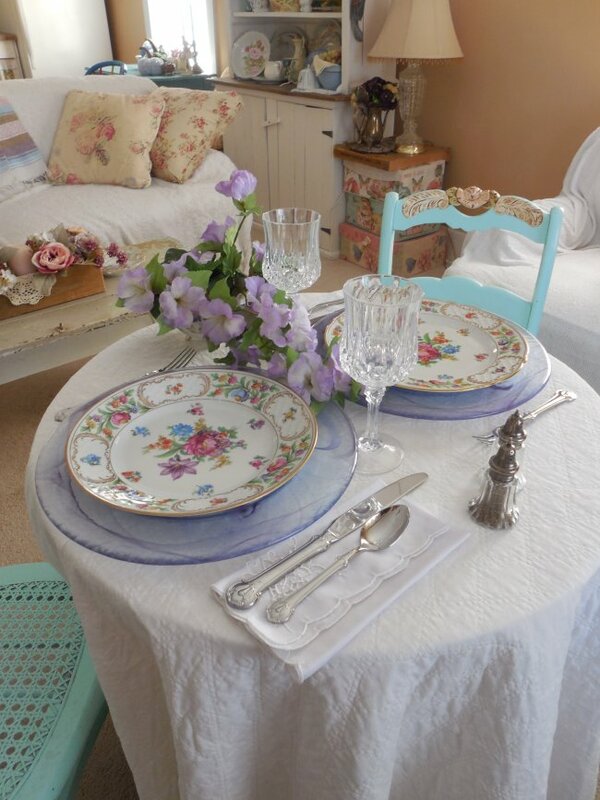 Here’s an image for Pinterest in case you would like to Pin my Dresden table for future inspiration. 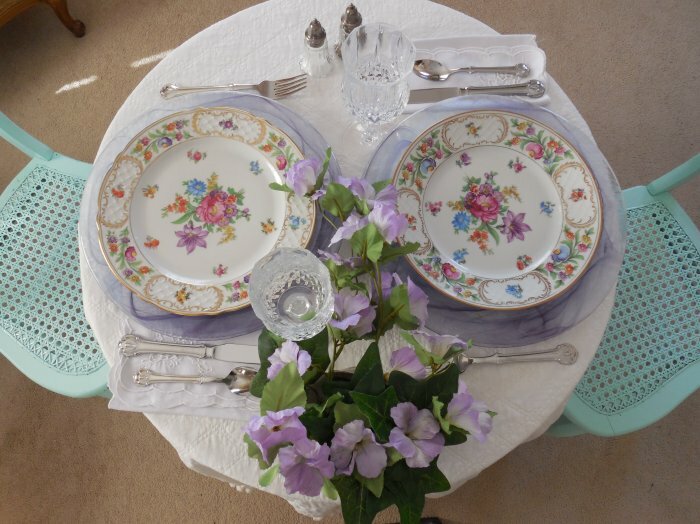 I’ll be sharing my Springtime table for two on Tablescape Thursday over at Between Naps on the Porch. Haha just kidding. 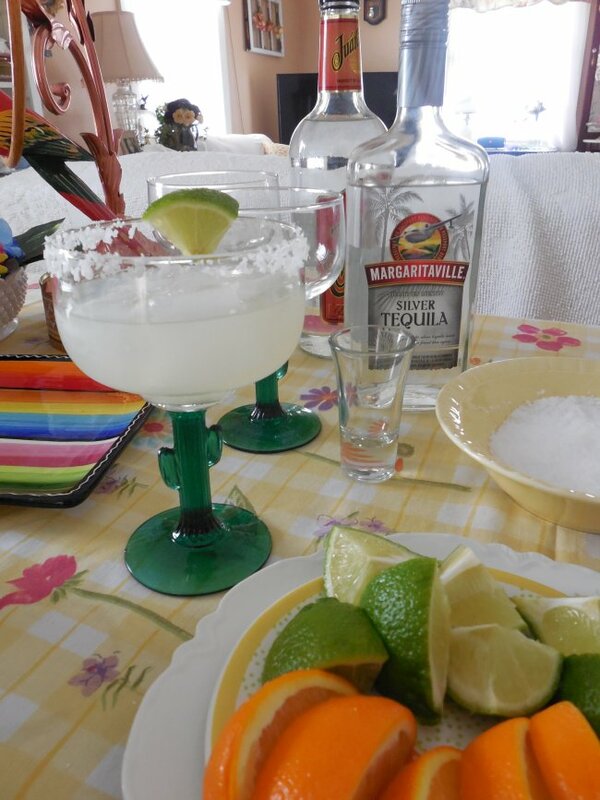 But I don’t think any mention of National Margarita Day can be made without also invoking the name of Mr. Buffett. 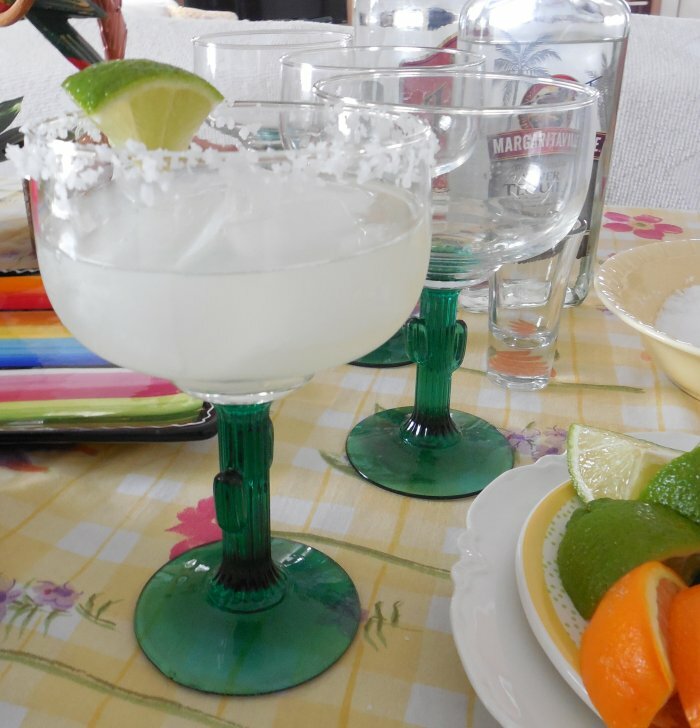 Because I daresay that without this song, the humble Margarita would have languished forever as a second-rate regional cocktail instead of becoming the smash-hit, nationally beloved frozen concoction that helps us hang on1. Apparently the origins of the Margarita cocktail are a bit murky, having been first created in the 1930’s or 1940’s, by a bartender yearning to fulfill the alcoholic needs of Ziegfeld showgirl Marjorie King, by a Texas socialite named Margaret Sames trying to impress her party guests (one of whom owned a major hotel chain at the time), or possibly by a young Brit named Margaret Thatcher while she was studying chemistry at Oxford. 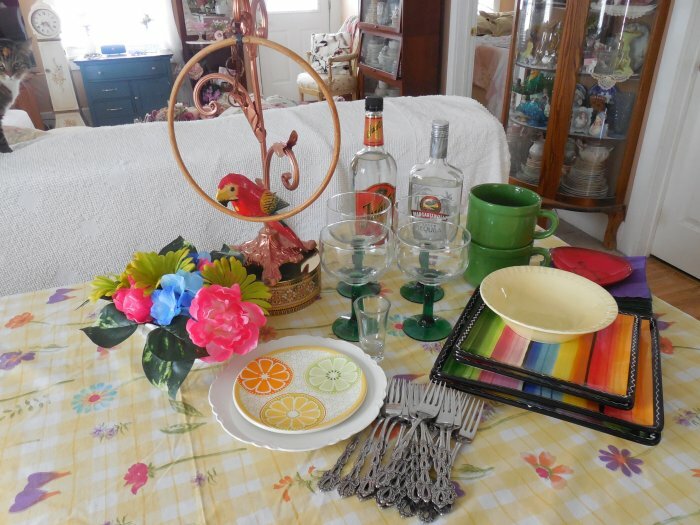 ANYWAY, in honor of National Margarita Day, I have set a fun and festive walk-around buffet table. 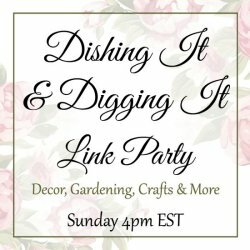 If I were to actually prepare the food for this gathering, it would most certainly include chicken nachos, quesadillas, a kettle of boiled shrimp, and my own dessert concoction featuring tequila-soaked bananas set afire using a blow-torch2. 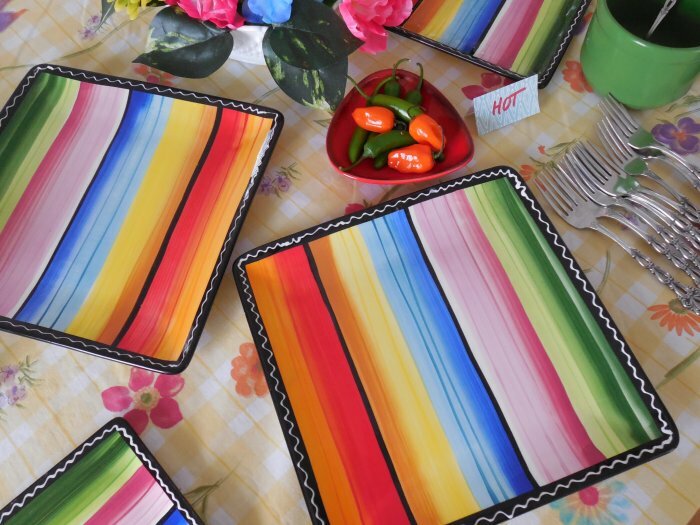 Plates used for this table are the gorgeous and colorful “Serape” by Certified International, which I originally used in a Cinco de Mayo table a couple of years ago. 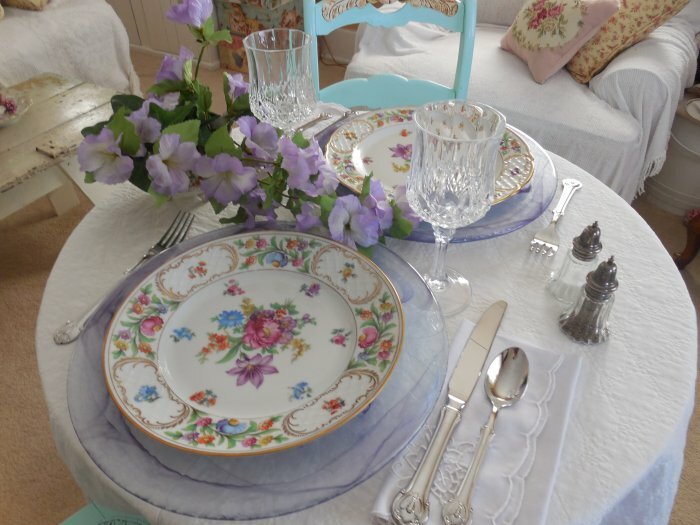 I love these plates because they coordinate so well with just about any bright color. 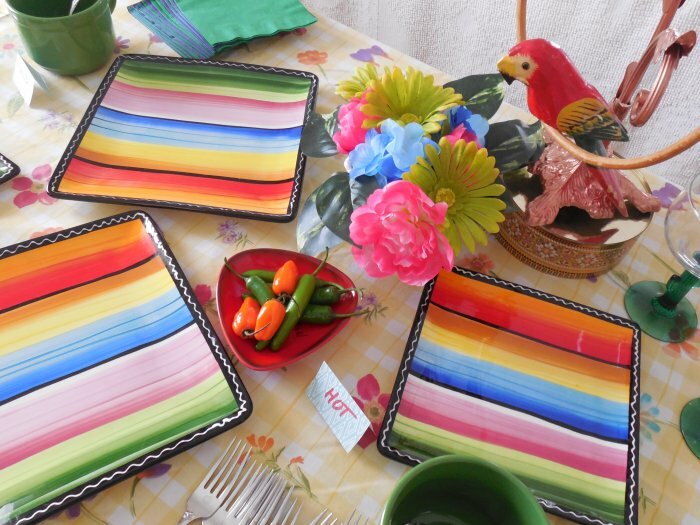 I have two dinner and two salad plates in this pattern – they are also wonderful as colorful serving pieces, which is how I’m using them here. 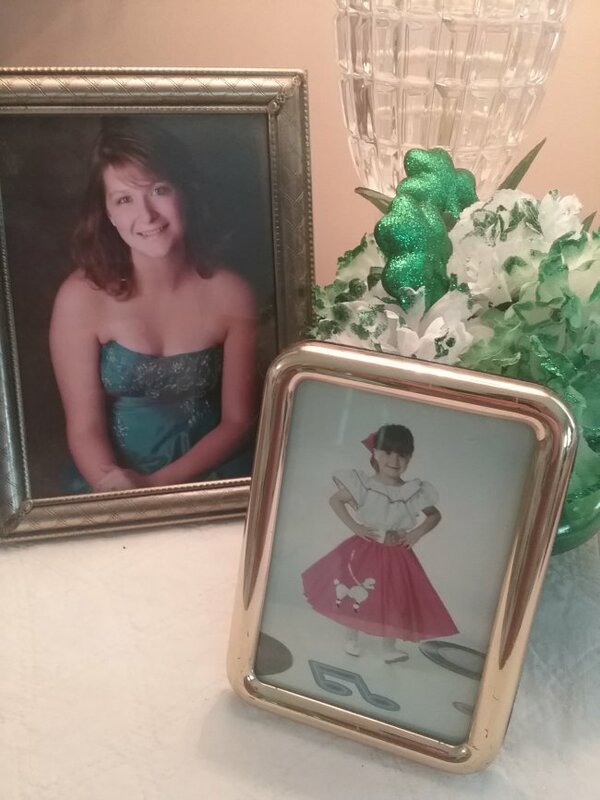 They were a Goodwill find. 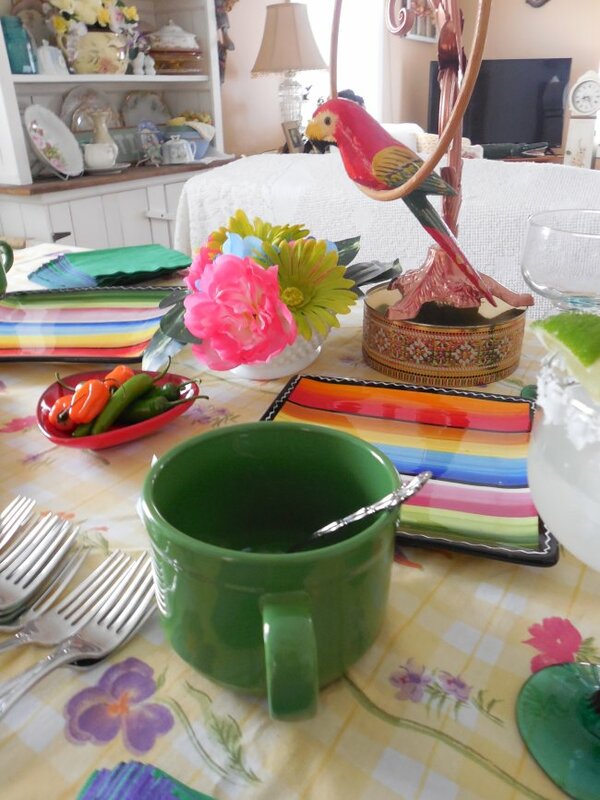 I’ve also set out my Dollar Tree margarita glasses with their seguaro cactus stems, some Oneida Chandelier flatware, and coordinating paper napkins in purple and green. 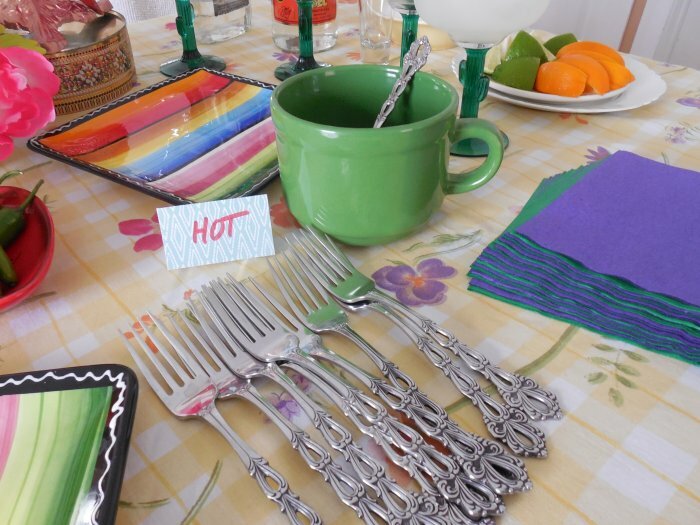 The green mugs, which we’ll use for salsa, are also from Dollar Tree. 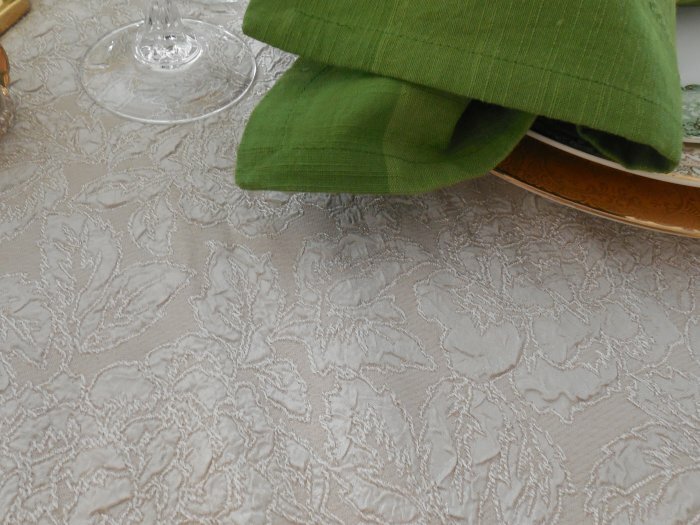 Our tablecloth is actually a full-size flat sheet. 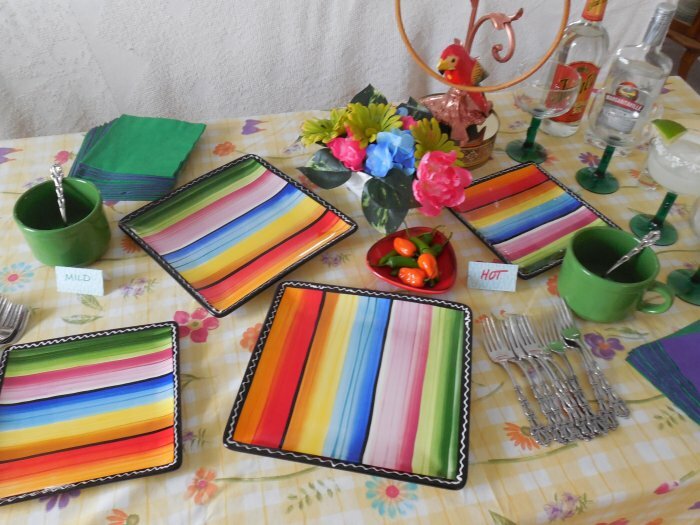 I like it because the colors and pattern work well with the plates without being overtly thematic. 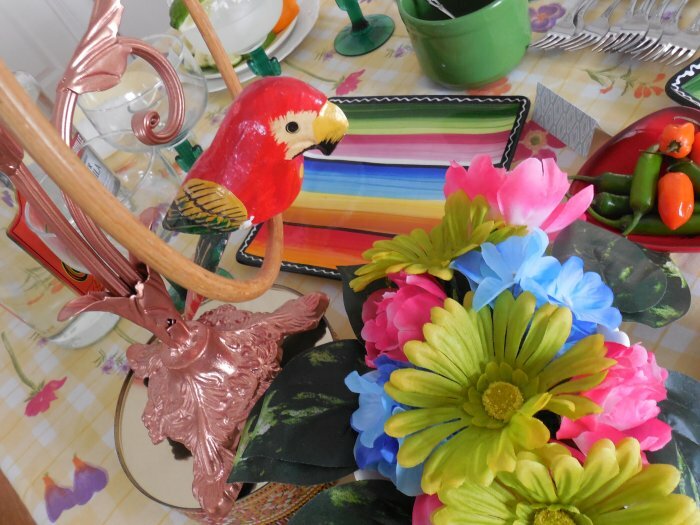 The festivities will be chaperoned by Wigglesworth, my bartending parrot. Wigglesworth was a garage sale find last year, and he normally supervises my designated weekly home-drinking date with Greg called Soco Poco Night. 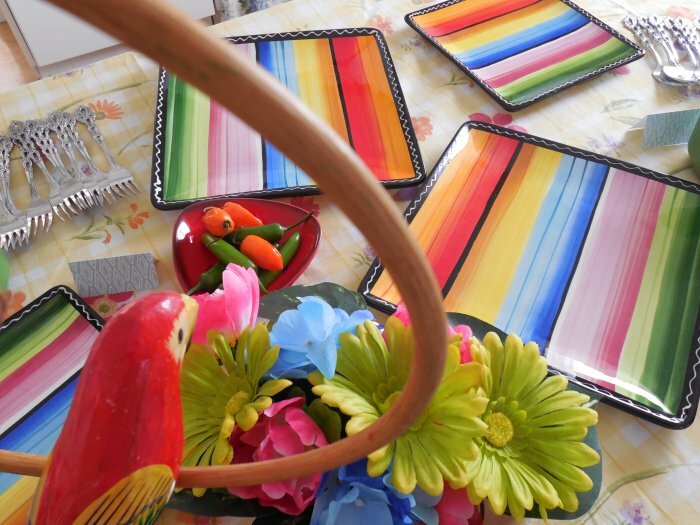 Wigglesworth’s presence helps bridge the two sides of the Margarita universe: the Texas/Mexican origins of the cocktail, and its evolution into a Caribbean/Key West cultural icon which ensures its status as the legacy beverage of a generation. 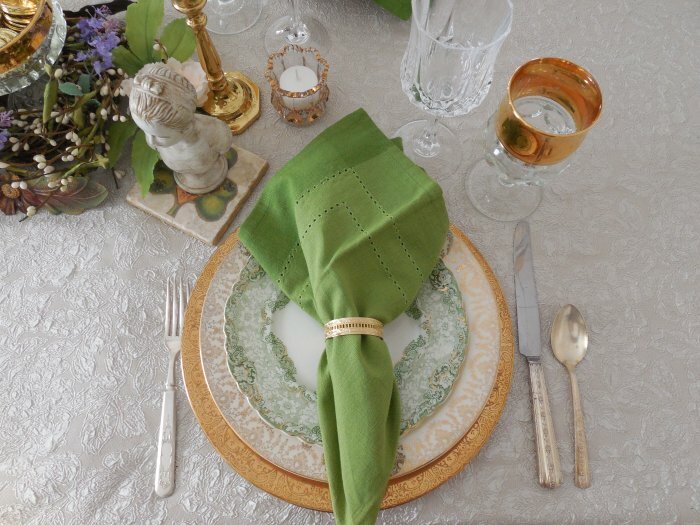 One thing I learned while setting this table: I did not understand at first how to cut lime wedges, so that’s why they look like something one might choke on rather than actual decorative wedges. You might also notice I put out orange wedges (cut properly). 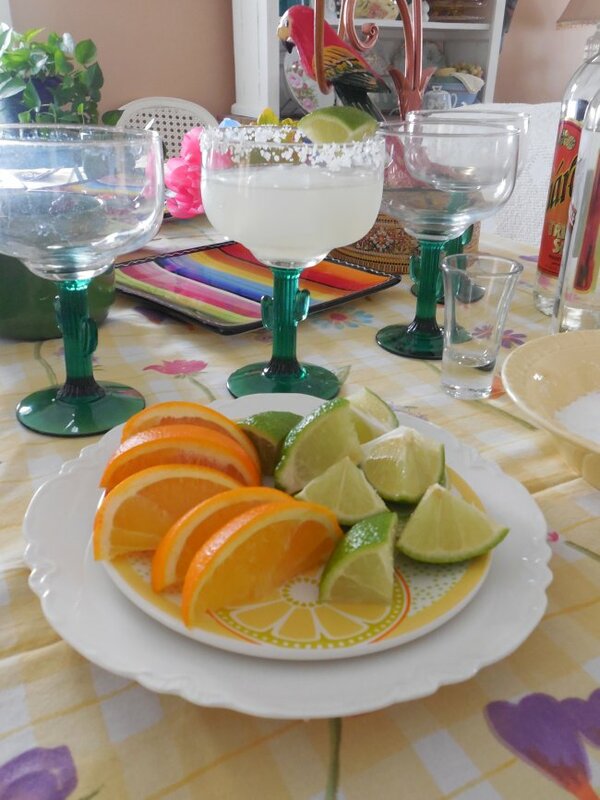 This is because an acquaintance recently told me about his friend who used to make his own tequila… this person stated that the best garnish for a Margarita was not lime, but rather orange. 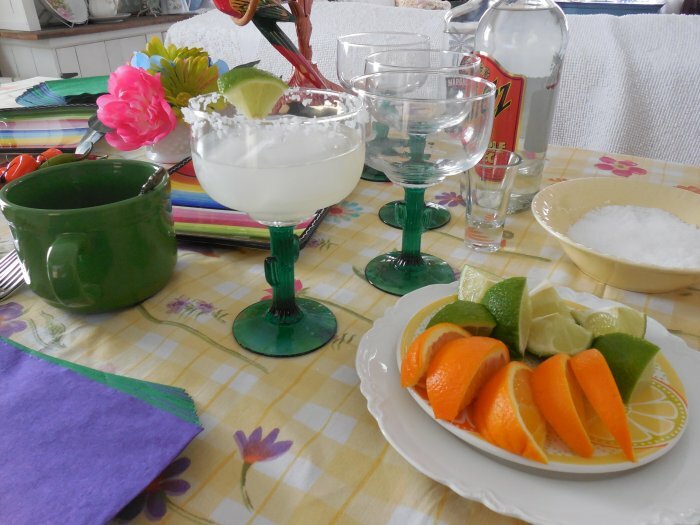 I suspect this is because the other alcoholic ingredient in a Margarita is the orange liqueur called Triple Sec (or Cointreau, if you’re a top-shelf person). 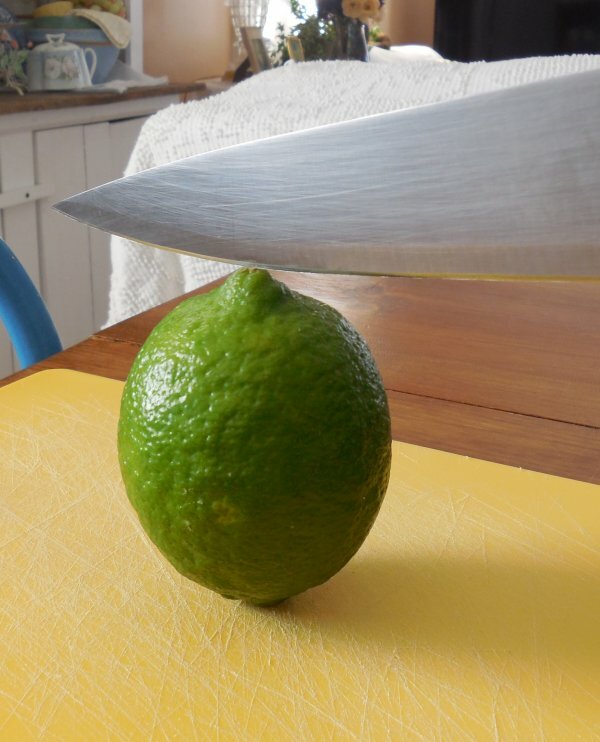 So if you’d like to be daring and try an orange wedge instead of lime, feel free – Wigglesworth says he will look the other way… this time. 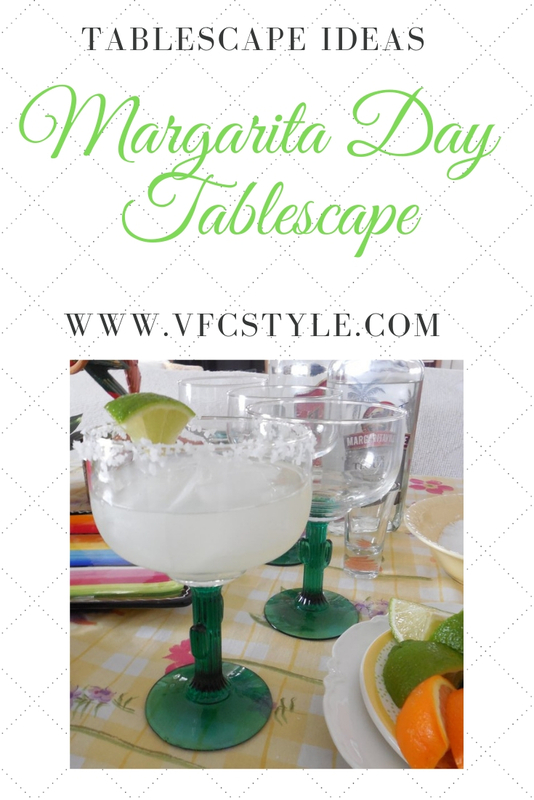 Now to close our celebration of National Margarita Day, I will offer this recipe for a classic “rocks” Margarita which I found online and really liked. (I normally drink strawberry margaritas, which are blended, and don’t particularly like the traditional version. But this one was good – I think because of the added sweetness.) This recipe is from The Cookful. 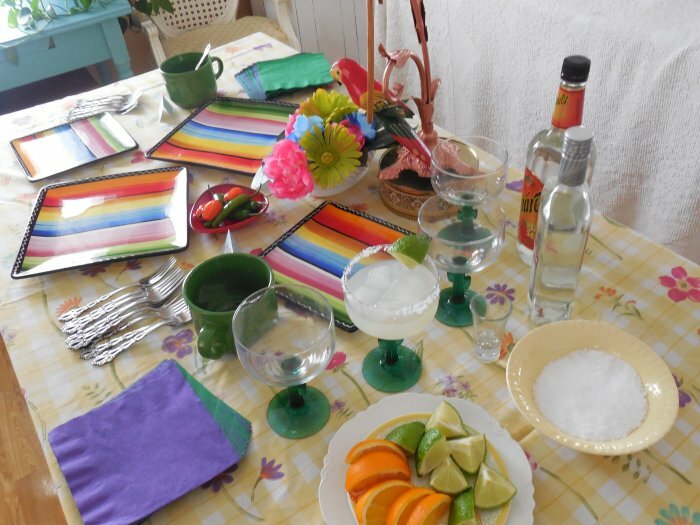 Salt the rim of your glass with the kosher salt. (Scream “Salt! Where’s the salt? Where’s the god-damn salt?” as you do this. It adds an element of psychosis to the proceedings, and pleases Mr. Buffett.) Add ice cubes to a cocktail shaker, add the remaining ingredients, and shake well for about 10 seconds. Add ice cubes to your glass, and pour the mixture over the ice. 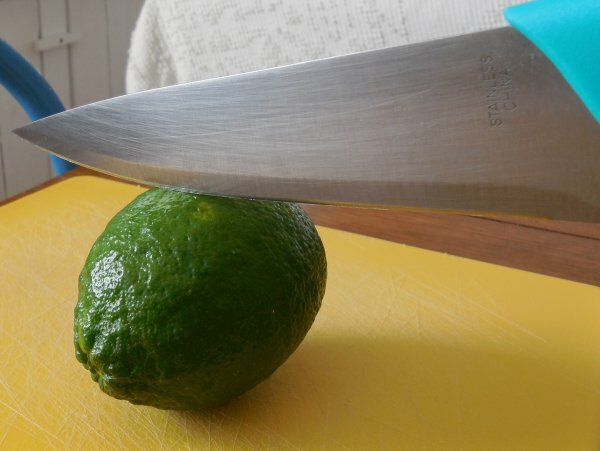 Garnish with lime or orange slices or wedges. And of course, the put-away shot! 2I literally just now got up from writing this post, poured a shot of tequila, and attempted to set it on fire with that thing I use to light the barbecue grill. Alas, my tequila did not burn, which is why my Bananas Tequila Flambe is not technically a flambe. Where is Margaret Thatcher when you need her chemistry expertise?